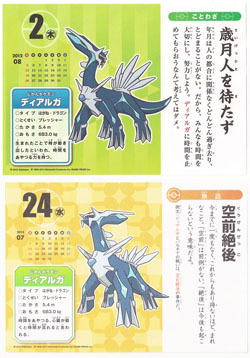 The trading cards on a separate page, here. A nifty clear file, using the art from the Pokemon Center bag (also on this page). A clear file is pretty much what it sounds like - a thin plastic folder that you can put a few papers in. 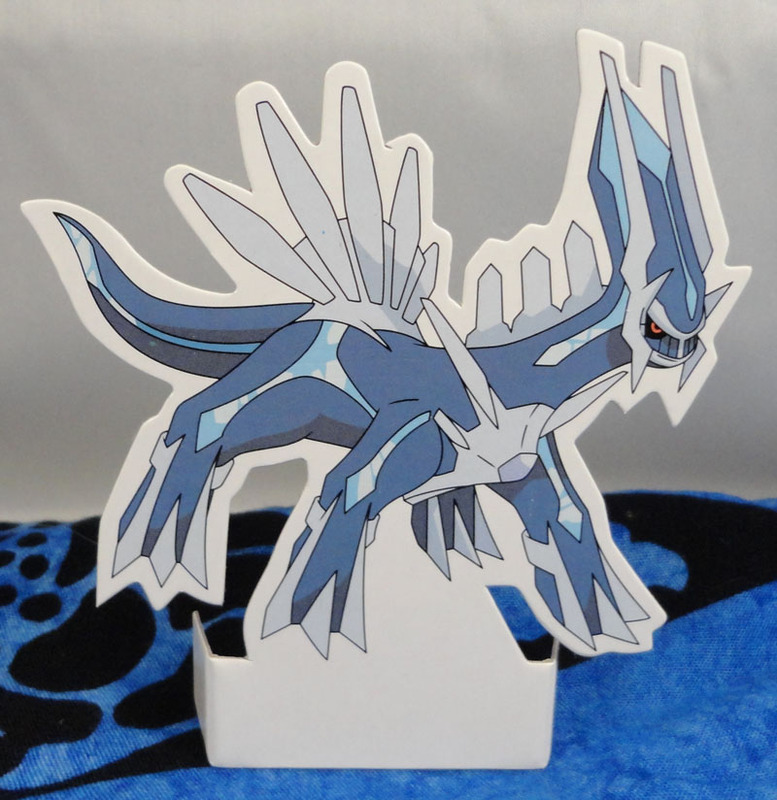 I knew from the title of the auction that this was a mini clear file, but I didn't realize it was this mini! See it next to my regular Dialga clear file here. 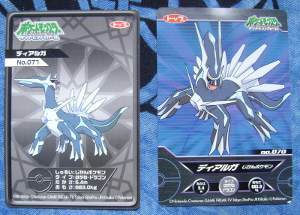 Palkia is on the back of this one (well, of both of these actually). 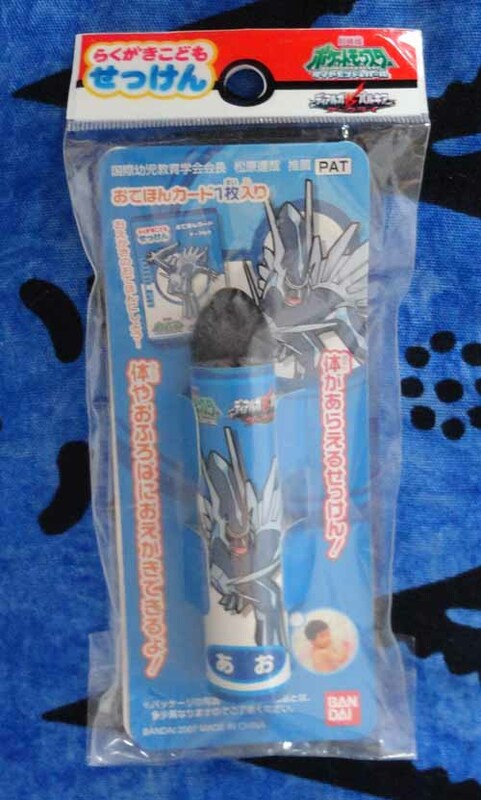 When I first saw this appear on Yahoo Japan, I thought it was a custom made item someone put together - the fuzzy picture made it look cheaply made, and I'd never seen it before. I passed it up the first time, but then when it was relisted, I just had to know, so I had Crescent Shop ask the seller if it was a custom made item or not. The seller replied that they received it as a bonus item when they purchased a game. 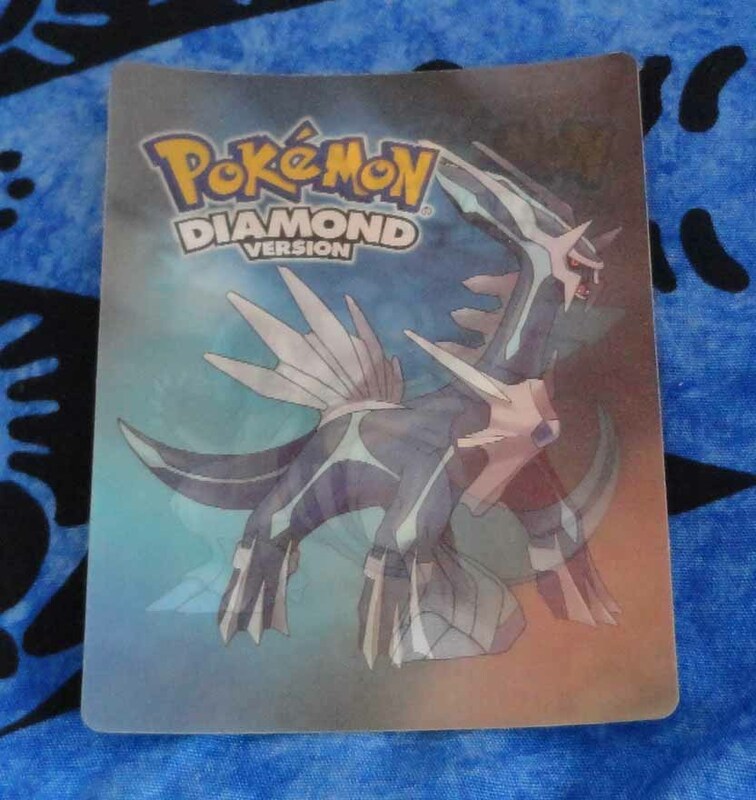 After comparing the picture to some of the other Diamond items in my collection (such as the tin and keychain), I realized they all had the game-specific things such as the Wifi note and the rating, so I went ahead and bought it. 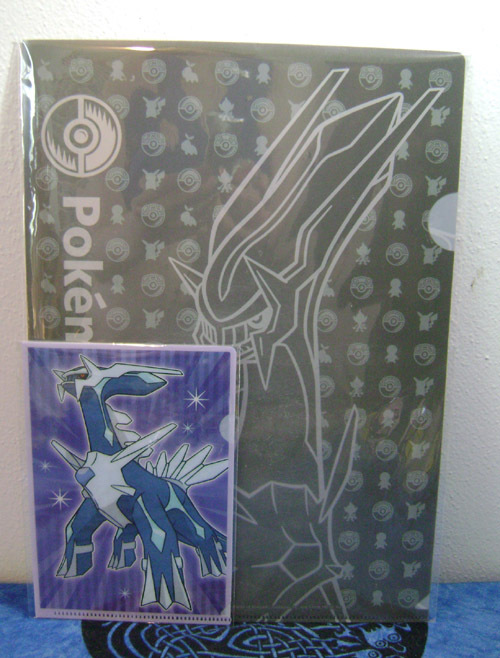 When I received it in hand, the file is much glossier and nicer looking than in the picture (and my picture doesn't really do it justice either), and is marked with a Pokemon Center and Dialga silhouette on the back. Definitely an official item, and a nice addition to the collection! During our Pokemon get-together for the Philadelphia Black & White mall tour, I was sitting in a bookstore resting my tired feet, after checking the store for Pokemon goodies and not finding anything. 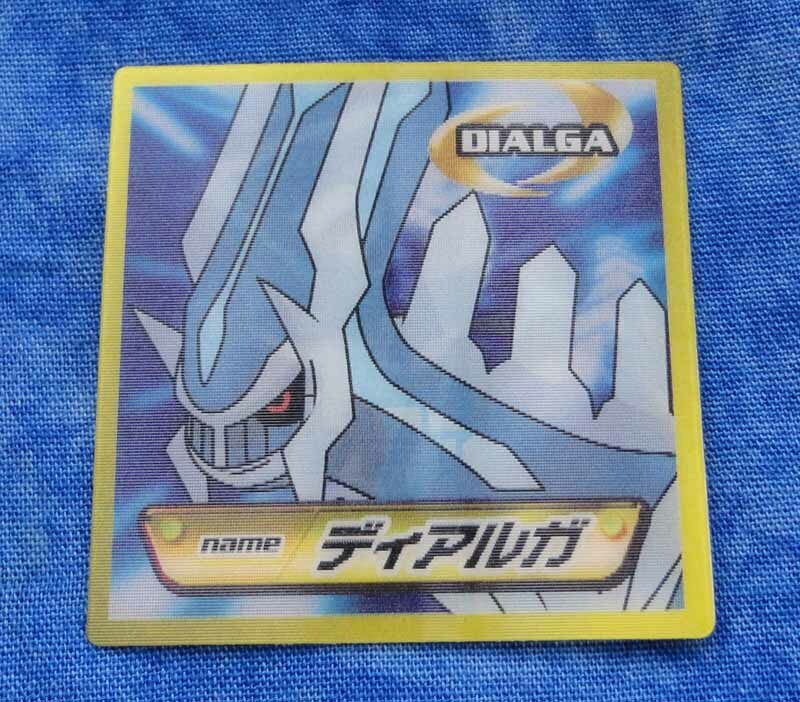 But then mamoswine of pkmncollectors came up to me, said, "I found a Dialga thing! 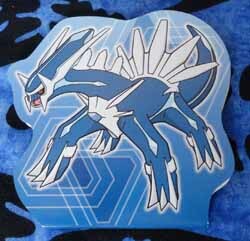 ", and led me to a book of Pokemon magnets, including this one! Thanks darling! <3 Like the other magnet in the photo, this one is from a book with metal pages and a bunch of magnets. You're supposed to arrange the magnets on the pages to tell a story, but of course I just take out the magnets and split them up ^_^; The rest of the set has Pokemon from the 12th movie like the Johto starters and Arceus. 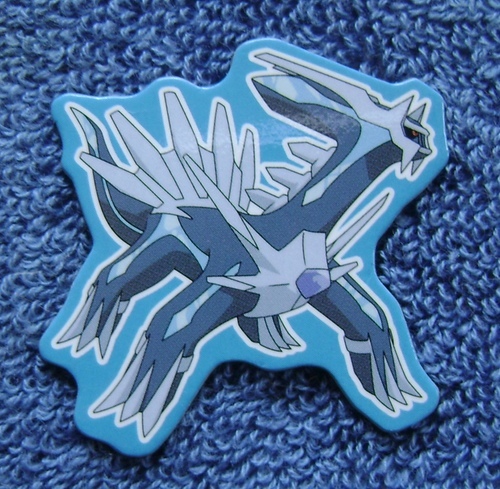 This is the only Dialga Ensky magnet I've been able to get my hands on so far. 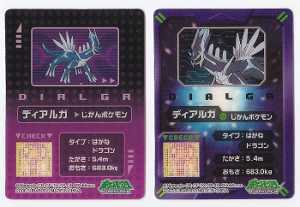 I believe it's from a Movie 10 set, and I know I'm at least still missing the Movie 12 and Set 2 Dialgas. I feel lucky to have even one of them though! 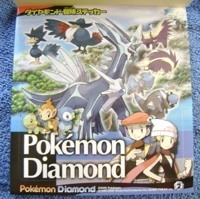 It looks like you can use it for some kind of game, but maybe　it just has Pokedex information? 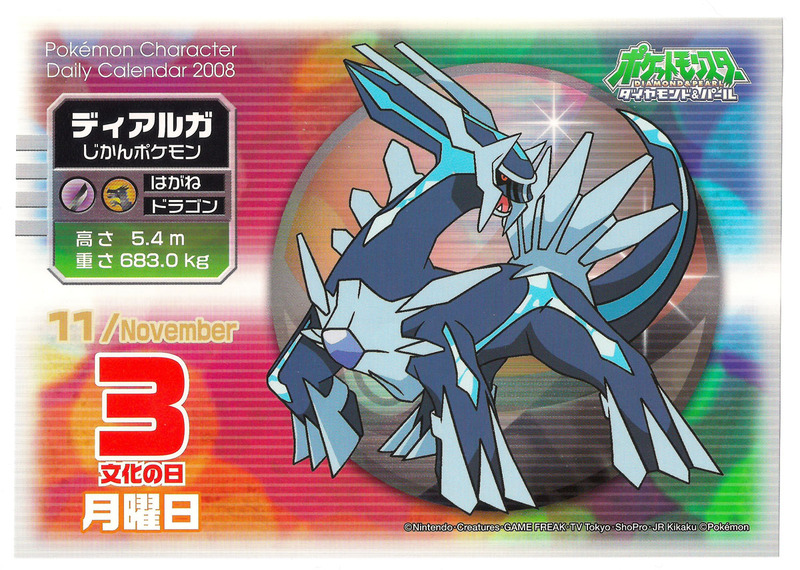 I see the Dragon/Steel typing on　there, at least. 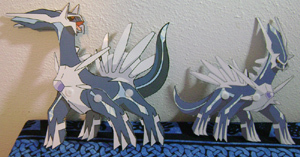 The first and third are from Sunyshore, and the second is from a 2008 set that I kept buying until I got Dialga. 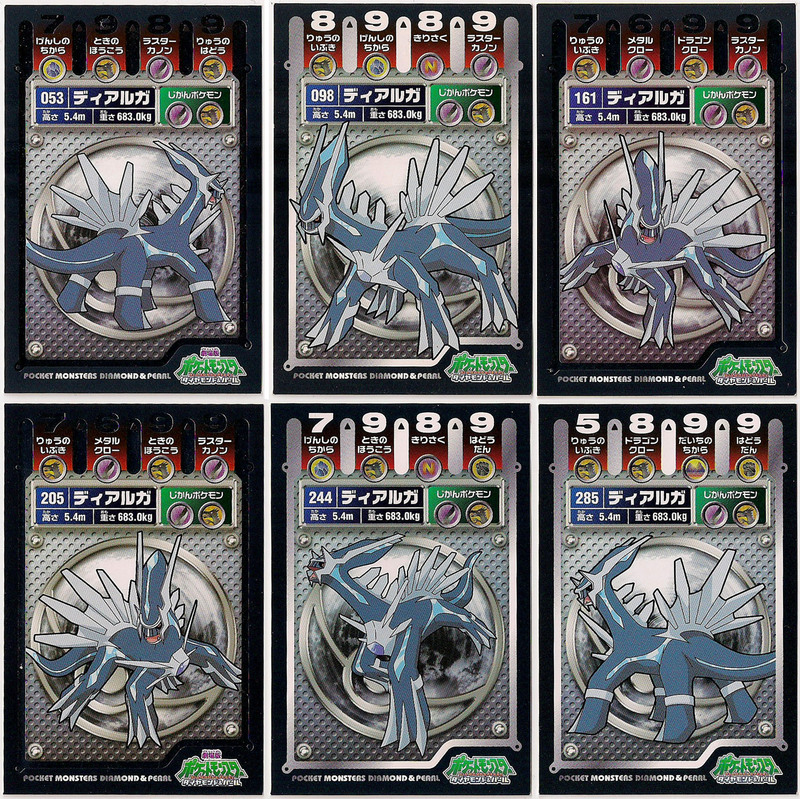 #8 is from set 3, I'm not sure of the sets for the others. This is from a little magnet pack featuring several DP Pokemon with various colored backgrounds. An extremely tiny and round magnet! This magnet came on a sheet (also a magnet) advertising some promotion running from 2008 to 2009. 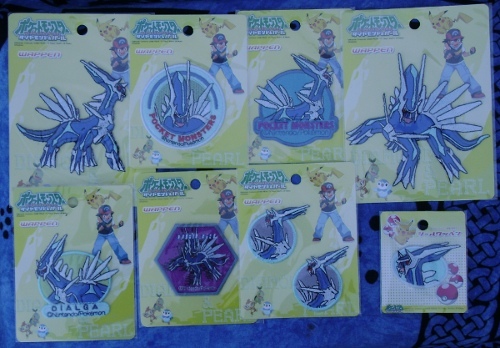 It also included Turtwig, Piplup, Chimchar, Palkia, and Pikachu (who is larger and has the Namco logo on his magnet). This one is also larger than I expected it would be, at about 2" diameter. I won the auction for only 50 yen! A nice and large pencilboard that I used as a mousepad for a while (under a protective surface, that is). I like the bold lines on this one! 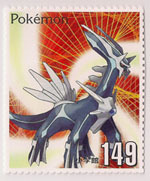 This was a prize obtainable through the 2007 version of the annual 7-11 summer stamp rally. 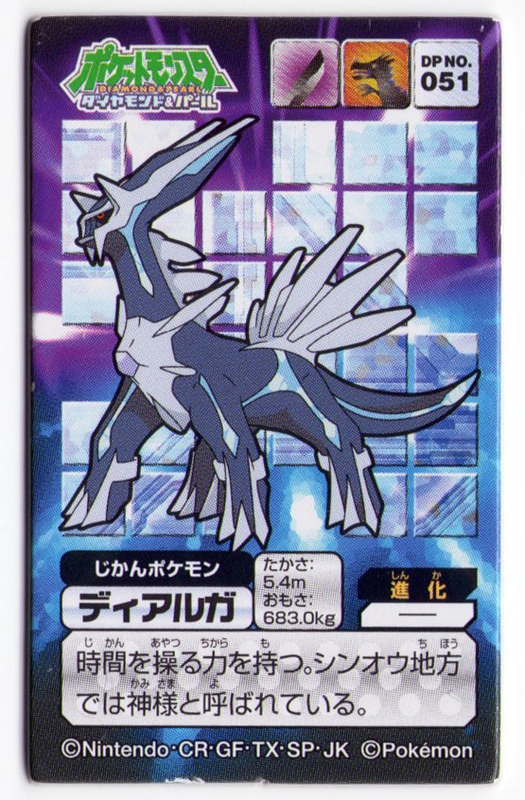 I don't usually go for items with Dialga among other Pokemon, but I couldn't resist Ash and his Pokemon being in awe of Dialga. Plus, the back has Dialga's silhouette and name, so no question there! 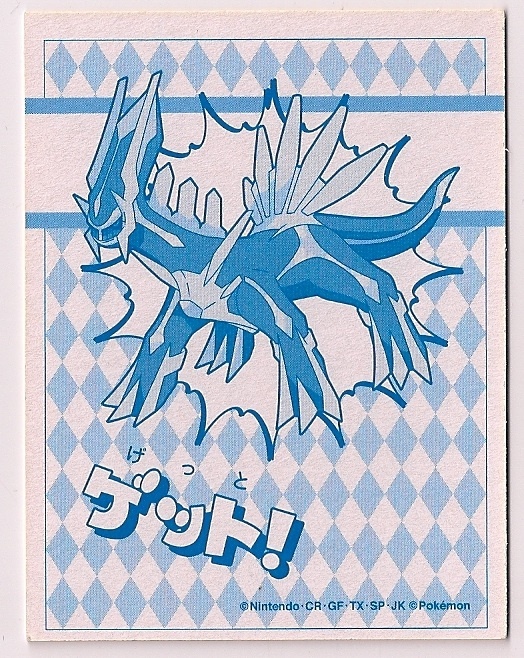 I'd seen these stencils around for many DP Pokemon, but never a Dialga, so for some reason I assumed he wasn't in the set. It was quite a surprise to find this stencil (featuring two Dialga) in an auction for just 100 yen! This small folder contains a bunch of stickers and some paper-inserts. 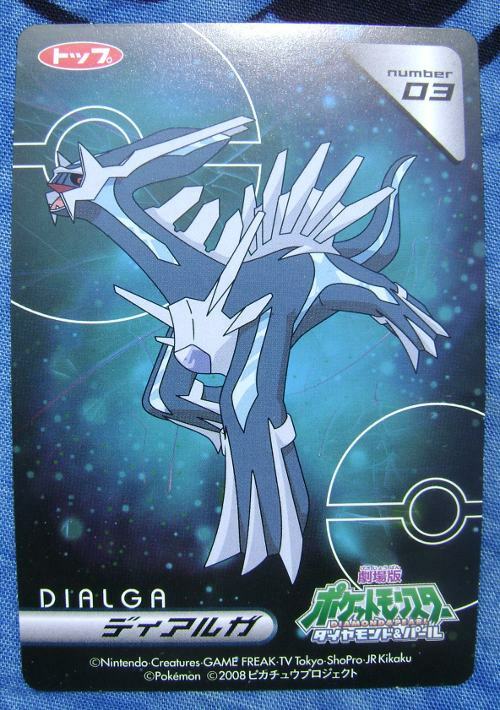 It's not 100% Dialga but it's Dialga-centric enough for me! 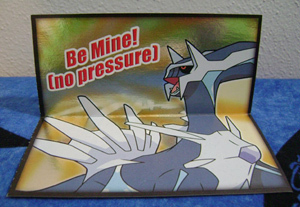 This somewhat silly valentine was a freebie from Raichu26. Amusing and official merch, into the collection it goes! 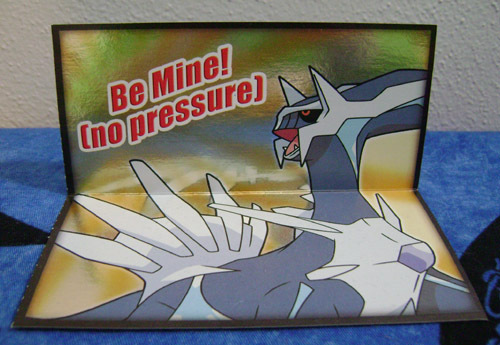 Hey, more Dialga valentines! 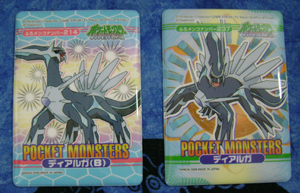 According to gengareric who traded these to me, this series was recalled (maybe in favor of the above series?) because the lollipops that were included with the valentines had springs in them. 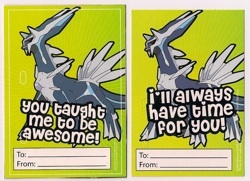 The one that says "You taught me to be awesome!" 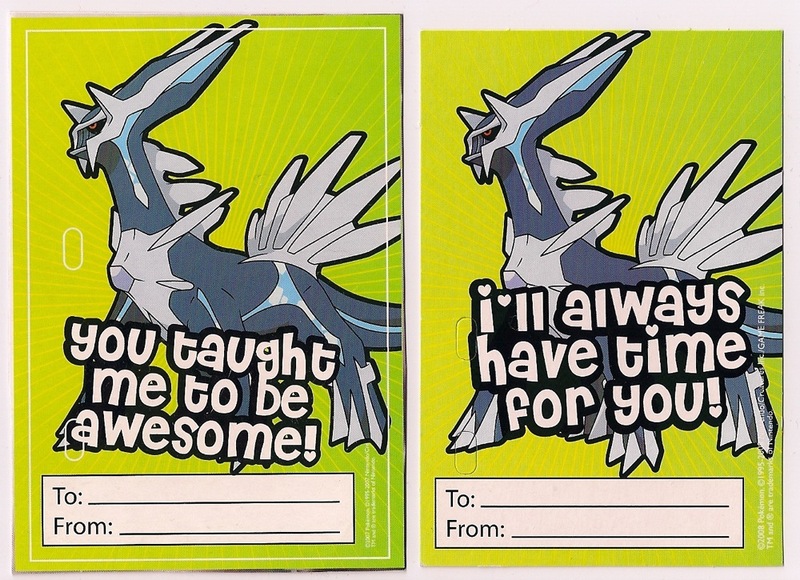 is a teacher valentine from the back of the package, which could be cut out and given to your teacher (whereas the others were to be given to your classmates). I couldn't get it to show in the photo, but this is actually like a tiny little post-it set, with numerous sheets. I suppose you're supposed to use each one as a little bookmark! I'm not sure if this was a leftover from the 10th movie goods, or if Dialga got a new notepad along with Giratina and Shaymin, but I'm glad I was able to get one either way! 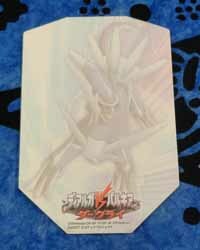 I'd seen this item in the 10th Movie goods listing and disregarded it, because it showed it together with the Darkrai and Palkia notepads and I thought they were all connected. 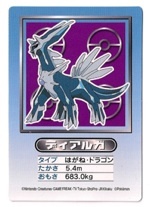 (Such as, joined at the sides with the ability to fold together or something.) 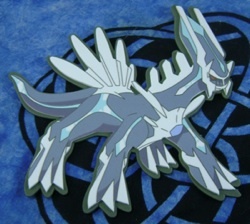 Then the set showed up at auction, not joined together at all! 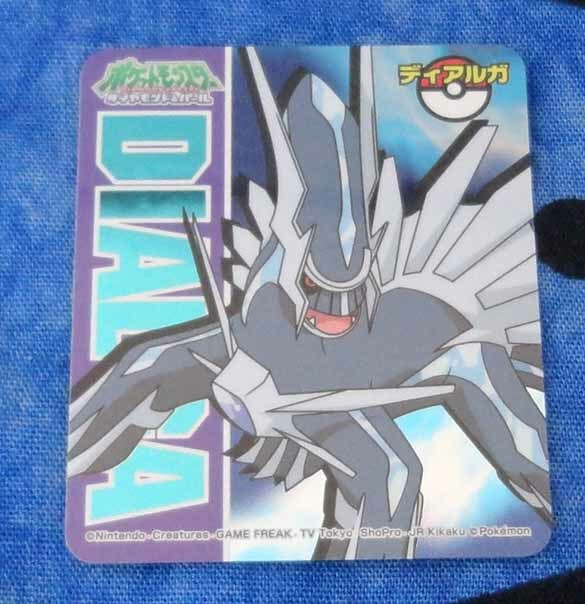 The seller might have separated them, but since I don't know for sure I'm just going to count this is a separate Dialga item for now. 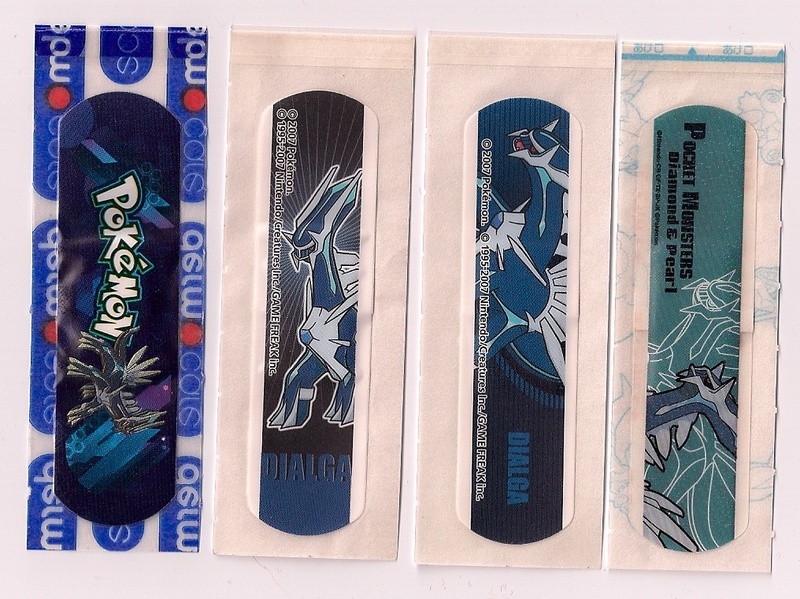 These stickers come with Pokemon Pan, a type of bread sold only in Japan. I found the first 6 on Yahoo Japan, picked up the last two in packages of the bread itself, and got the newest 'diving' one as part of a trade with crunch385. With the newest addition, I believe I have them all again! These are nifty textured reusable stickers that are about 1 1/2" tall. 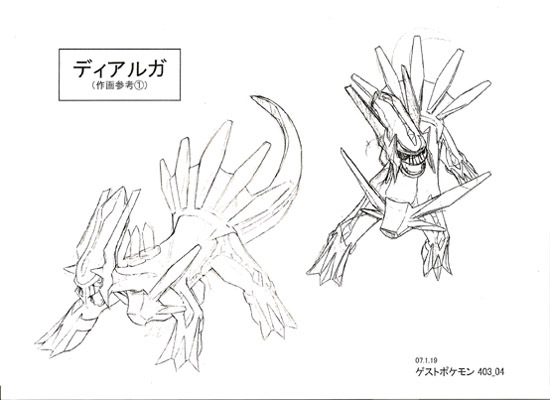 What interesting poses! They come in a variety of plain paper, metallic, and sparkly. So far I have 37 different ones! Help me finish up this collection, won't you? 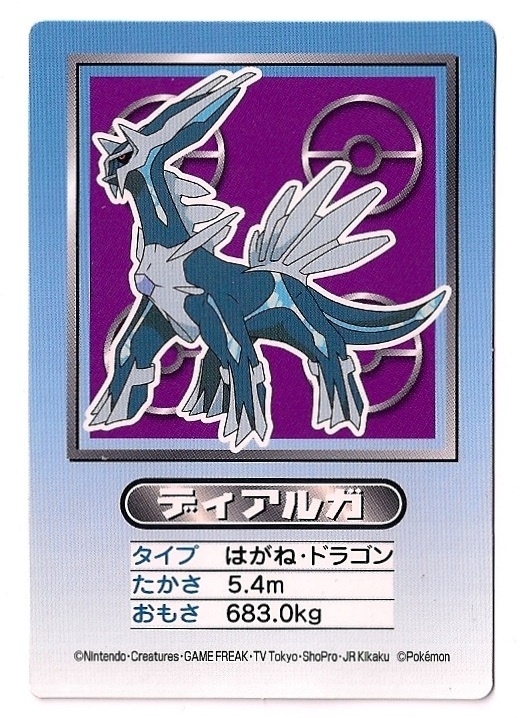 Several of these were found in Japan as part of the sticker packs. 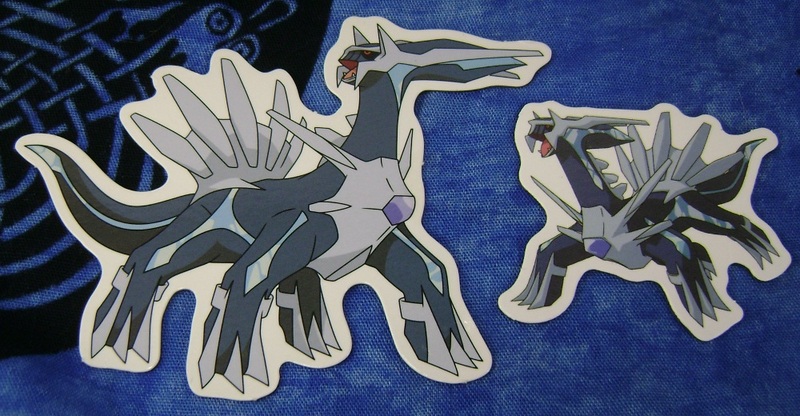 These have a reflective plastic surface, and are a bit thicker than the regular stickers. 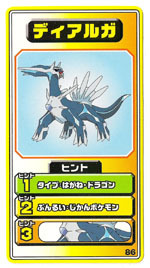 This card looks much like an Amada sticker, but is made up of 2 stickers, with a different image on the front and back. The back (or whichever the lighter side is) is reflective. 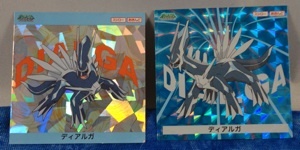 The new one on the right is from the second general DP set (though possibly is a rare, given its holo background) and the other is from an 11th movie set. This sticker is from the Black&White version of the Amada Retsuden stickers above. 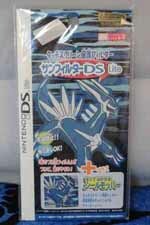 It's meant to be used with the Pokedex Pro 3DS app to view the Pokemon in "real life" on your 3DS camera. 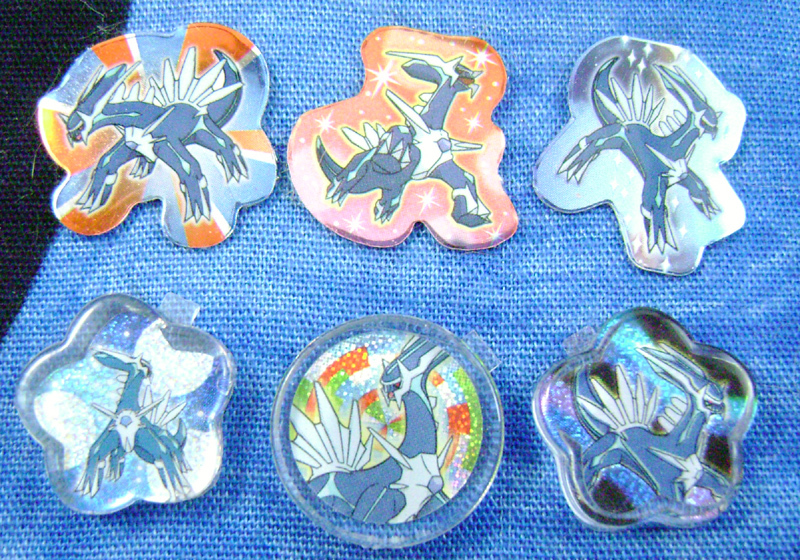 Thanks to the Pokemon Noodle Club" for the information about these! 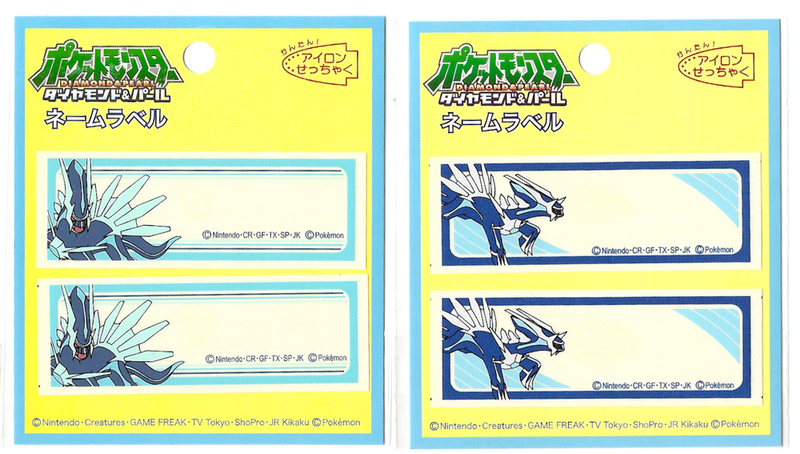 Marumiya has a set of Pokemon stickers going back to at least AG era (if not earlier) where one random sticker is enclosed with any Marumiya Pokemon food product: things like shaped seaweed, curry, rice seasoning, and so on. I didn't really know about these until after DP era had ended, and the stickers were pretty hard to find on auction sites. 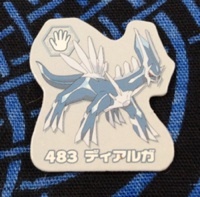 On top of that, they come with a top layer to peel off that only shows a Pokeball and a number, and unless you know the number for that particular set, it's up to luck whether the Pokemon is the one you're after. (Once you have it in hand, you can hold the sticker up to the light to see who's underneath, but this doesn't work if you're just looking at auctions for the stickers...) I searched around for collection sites listing these numbers, but didn't find any lists with Dialga, so I bought a small set of Master Ball patterned stickers and hoped for the best. And out came the one on the right! I had to peel off the Master Ball portion to reveal the Dialga card, but I took a scan of it beforehand - you can see that here. 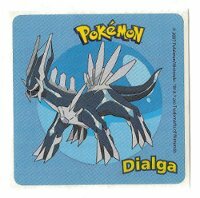 I hadn't had that one long when I was searching for other Marumiya stickers, and was very surprised to find another Dialga one! 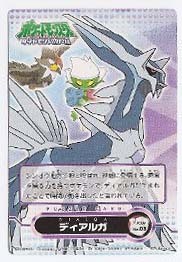 I'm guessing it's from an earlier DP series, as most of the ones I have in that style are AG Pokemon or early release DP Pokemon like Weavile. 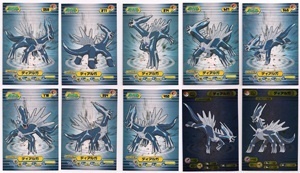 Anyway, there are probably still more Dialga in this set, so I'll keep searching! 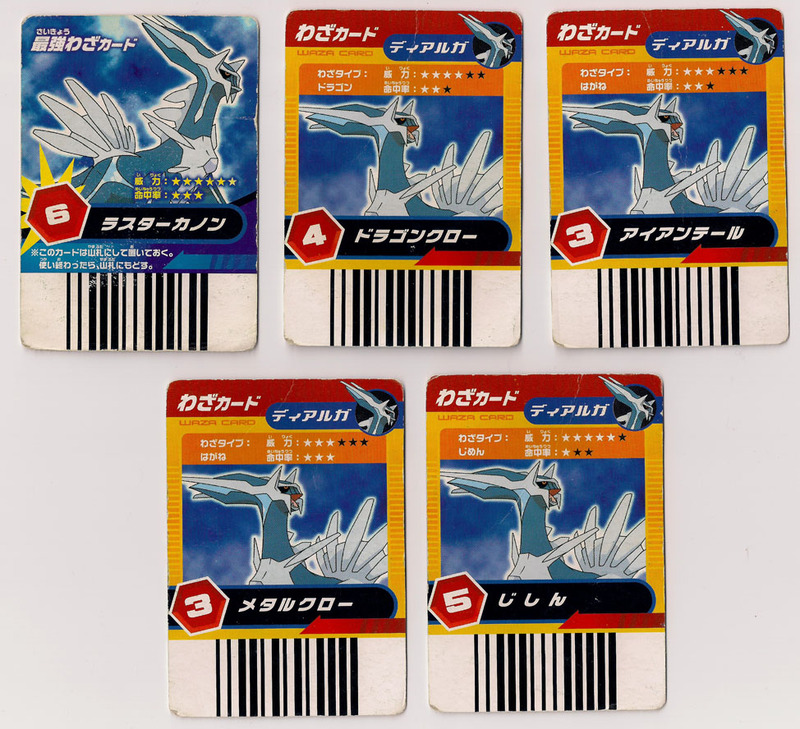 These stickers are from the same series as the above, but a BW set - the last BW set, I believe. 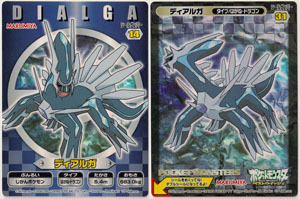 And it had not just one, but two different Dialga! 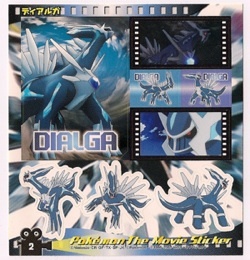 The stickers on top featured different Pokemon and poses from the smooth cards underneath, and Dialga (and Jolteon) were featured on both types. Let's not discuss how many packs I bought trying to get both of these. 'Dialga with Diamonds' is a little subcollection of mine, so I was really pleased to find this sticker for sale in a lot. 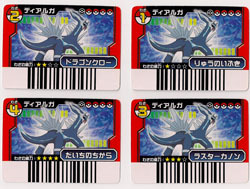 Like the others in a set, it features Pokemon Center-exclusive art! 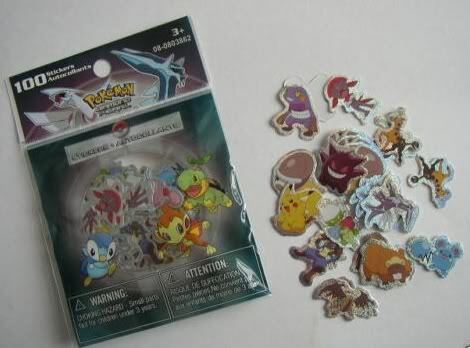 I did a little searching around and found a photo of these stickers with the box and candy. 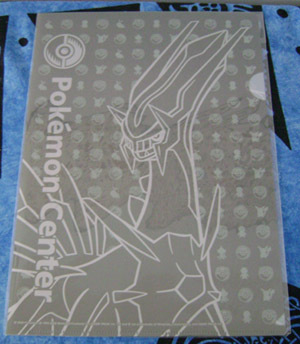 The back features Dialga, Palkia, and Darkrai, since that was a movie edition set. (Thanks to this blog for the information and photo! 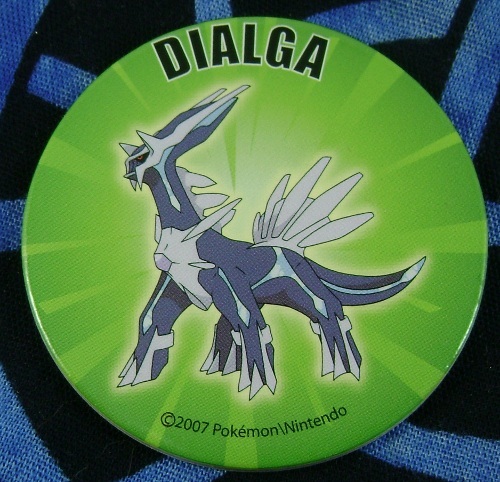 The origin of this sticker is a mystery to me. 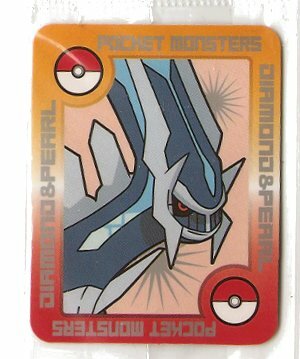 It features the art from the Diamond and Pearl set of the Pokemon TCG (DP1), but is marked 2009, which is a few years later than that. This is from a really neat set of "Let's Learn Chinese!" 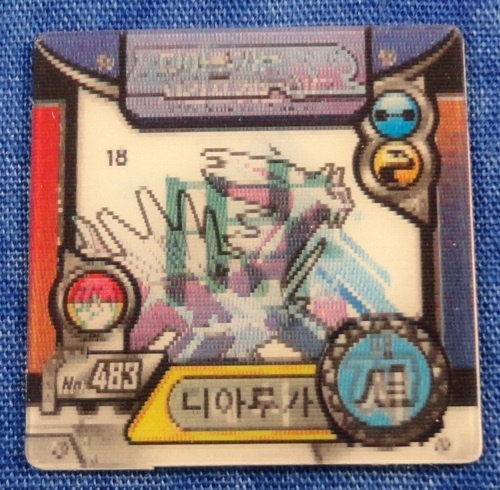 Korean stickers. 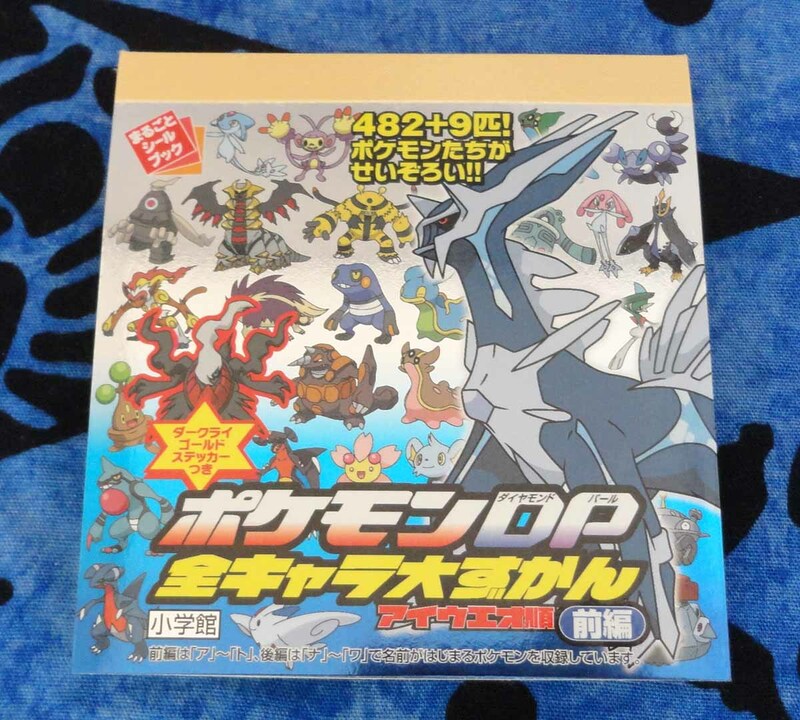 I don't know Korean or Chinese at all, but I do know some Japanese, and Japanese has borrowed a lot of characters from Chinese, so I can recognize most of the characters in this set, and they're appropriate for the Pokemon shown on the sticker. 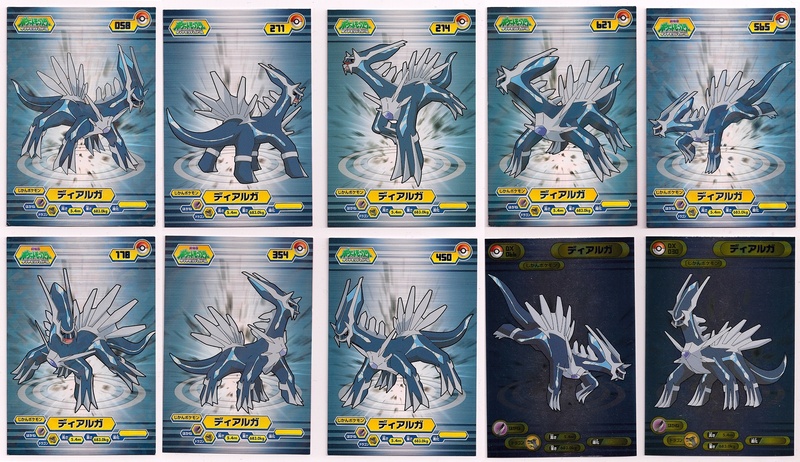 Dialga's is 時, which means 'time' in Japanese, and I'd guess it means the same in Chinese too! This is part of a large set of stickers from South America. 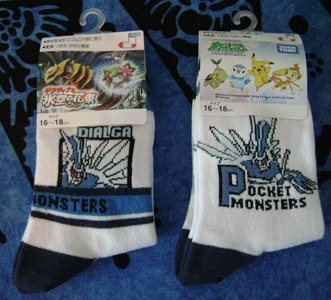 If not for pkmncollectors and worldwide trading, I would have had no way to get these! 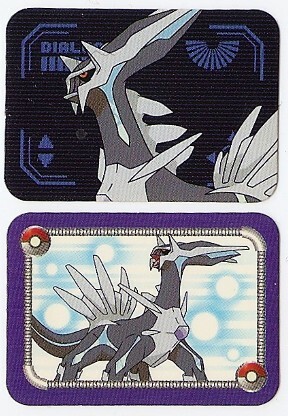 The cards that came with the Can Badges. 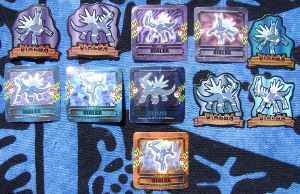 I have 4 badges but only 3 cards; the series 1 badges came with a game card featuring several Pokemon, rather than stickers like these. These three show series numbers of 2, 3, and 7. 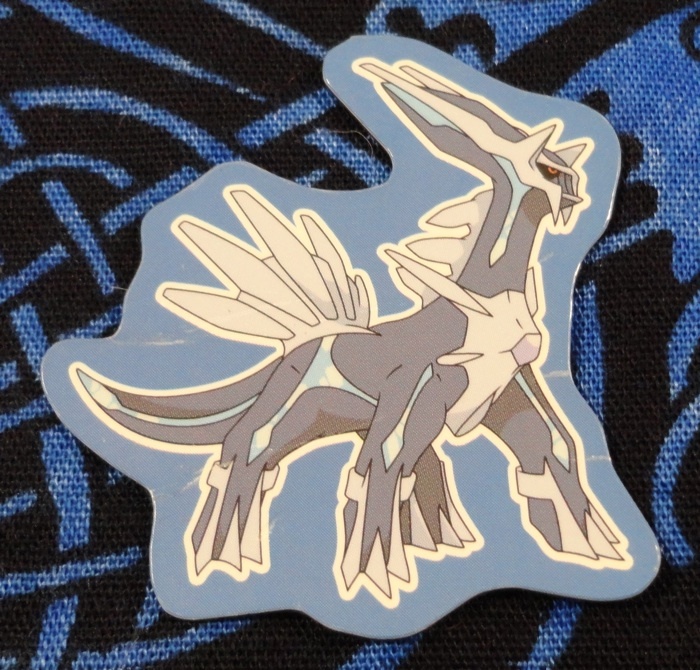 This sticker was on my wants list for quite a while before I finally found it in a lot! 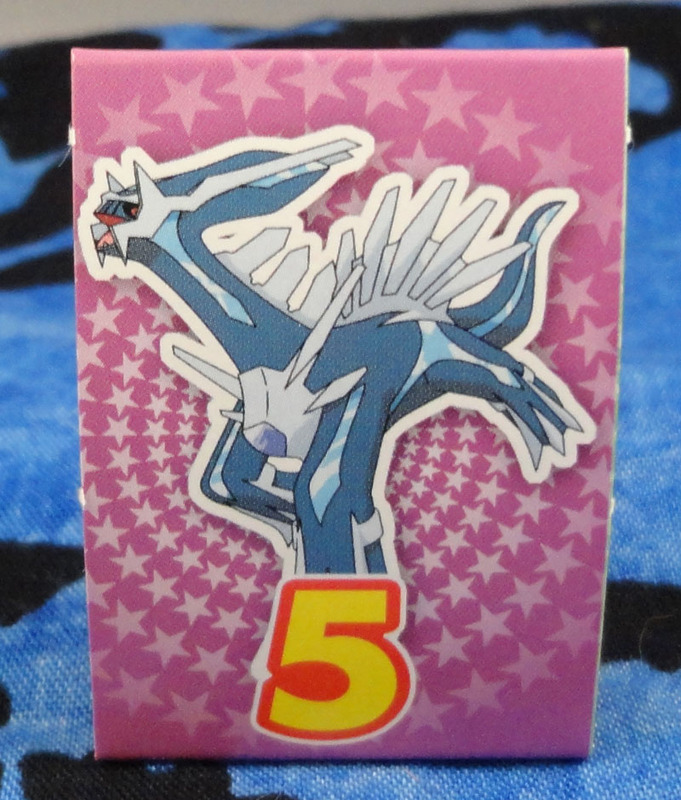 According to the back, it's part of a 40 sticker set released by Asahimatsu, a Japanese food company. 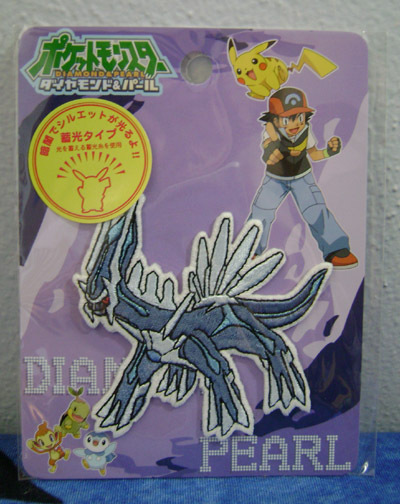 I'd guess that like many other stickers, it was packaged with some kind of Pokemon food product. 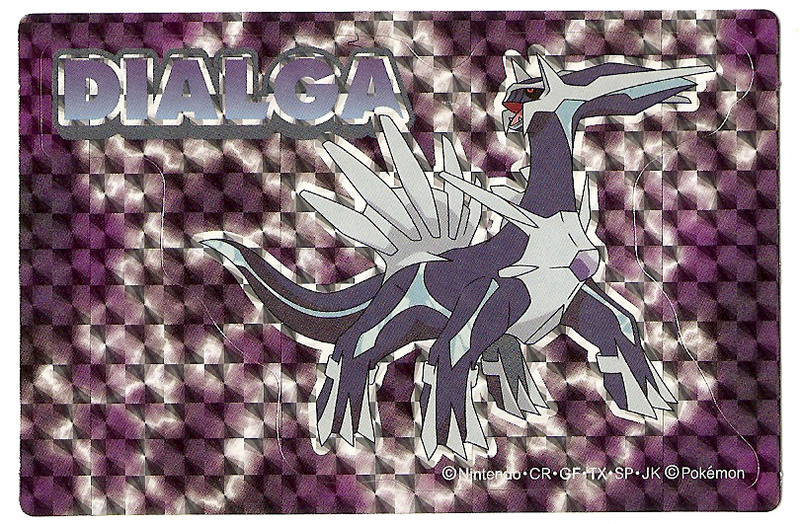 Another sticker packaged with snacks, this one features Dialga on a nice metallic background. 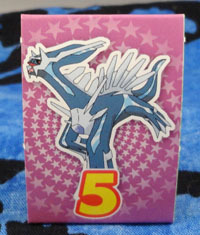 This sticker was actually on my wanted list for a long time, as part of this set. I finally found it on eCrater in a random search! 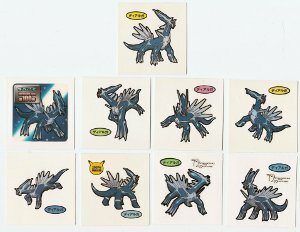 A sheet of rare mini stickers dedicated to Dialga! 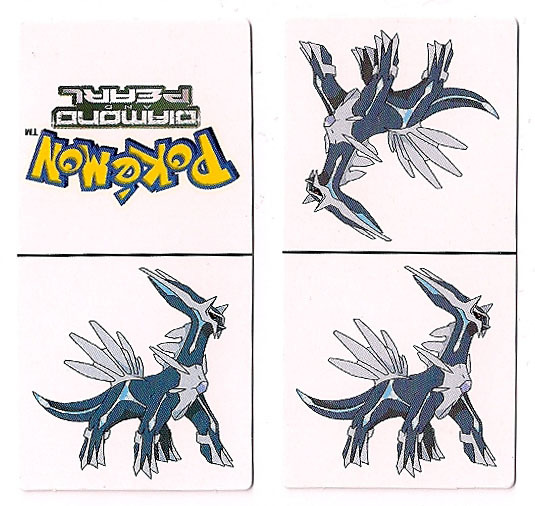 These stickers are just like the above, but gathered from many different sheets that featured a variety of Pokemon. Each sticker is individually backed and can be punched out from the sheet, so it's easy to add these to my collection! Bandages are a type of sticker, right? 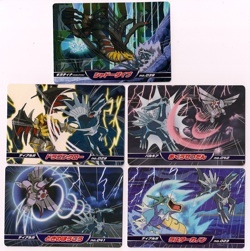 These are probably intended to be used, but I'm in a collector, so these will remain in a binder with my other flats! 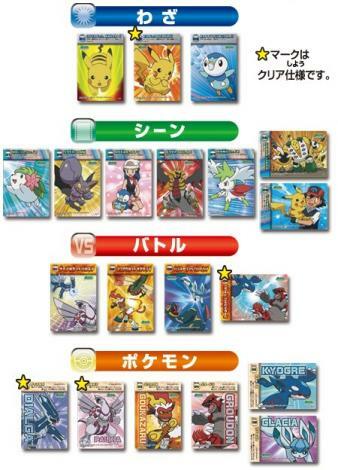 The far right one (from Sunyshore) is from a set with Shinx and others (perhaps the Starly line)? 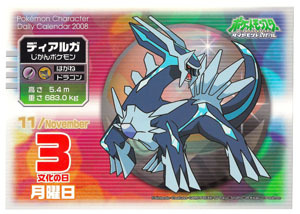 The third one (from snowball21) is from a Pokemon Center tin that also features Palkia, Infernape, Torterra, and Lucario. 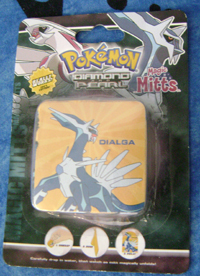 The second one is probably also from a Pokemon Center bandage set, and I got it through a trade with blackberrypie, another Dialga collector! The far left one is a Europe exclusive, received from blazikenbabe in a trade! I saw this sticker in a sales post and snapped it up, since I'd never seen it before. But when I got it, I was a bit puzzled. 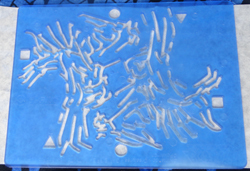 The left, right, and bottom edges are clearly as they were made, but the top has been cut with scissors and has an uneven edge. 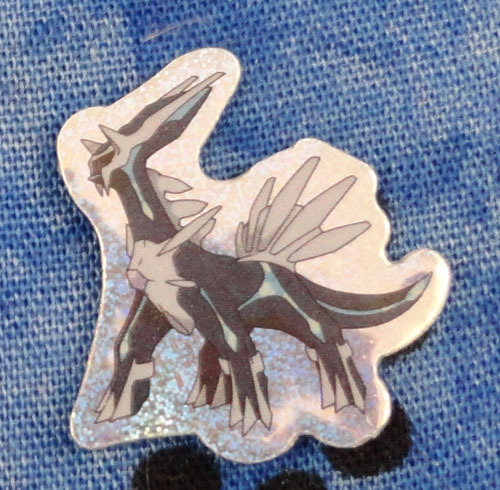 I don't collect Dialga stickers that've been cut out of a sheet (I have my hands full just getting the ones where he appears singly), but I didn't know if this was part of a sheet or not! 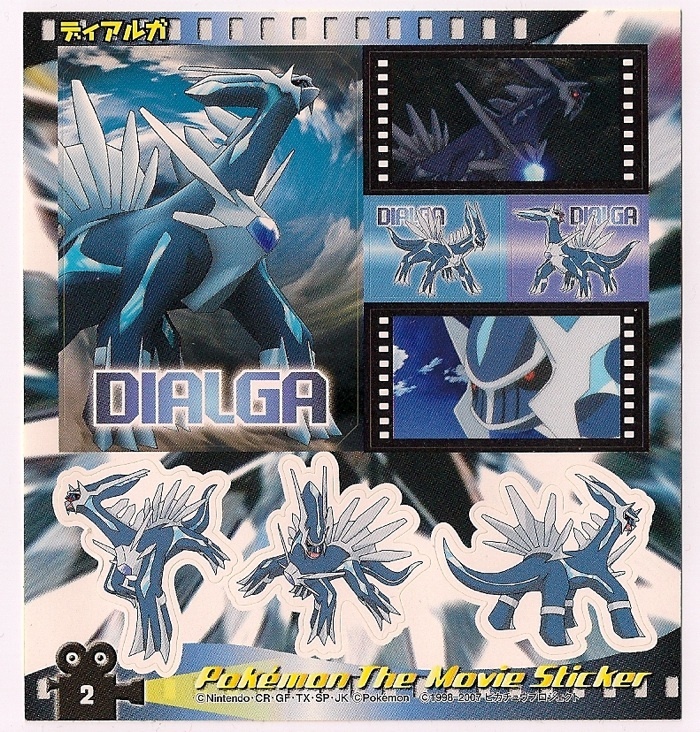 I still haven't found this complete sheet, but I did find others in the set (Arceus and Giratina) and it appears that there are 4 stickers per sheet - one big one (like this Dialga) and 3 small ones of other Pokemon from the movie. 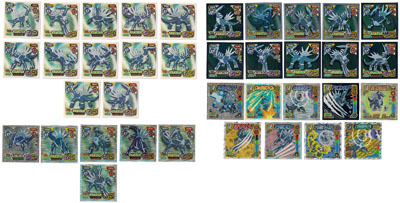 So whoever got that Dialga probably just split the sheet up. I'd still like to find this Dialga intact, since I know the sheet is Dialga-centric enough for me to want it now! 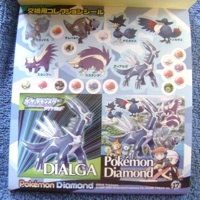 These little stickers are from a Pokeball Sticker Pack (モンスターシールパック), which is a plastic featuring stickers of several hyped DP Pokemon. 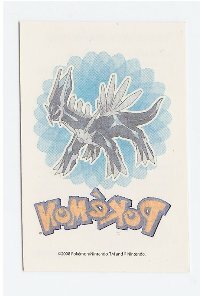 I don't know much about these oddly designed stickers, other than they are marked Topp on the back and feature a Who's that Pokemon? question. 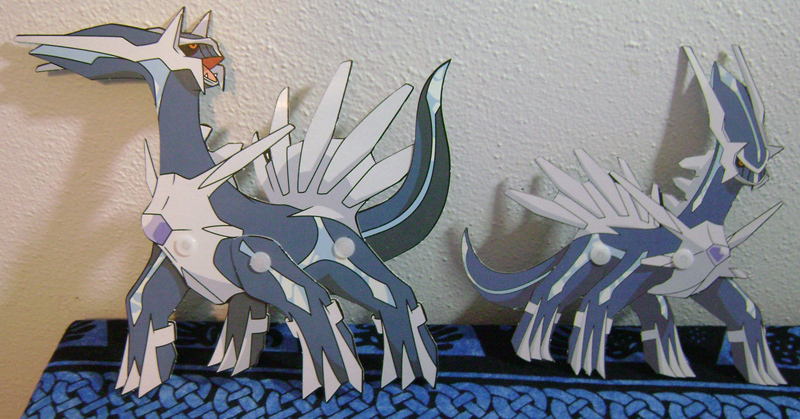 (One has Lanturn, and the other has Cranidos.) Like many other stickers here, I was able to get these through trades with Crunch, saving me money on deputy service fees! Thanks for helping out my collection so much! 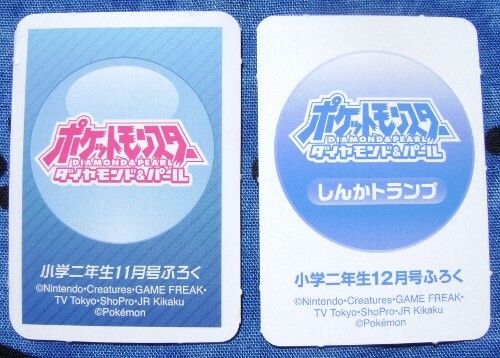 These stickers go with the Subarudo ramune cards, but I'm not sure which set exactly these are part of. 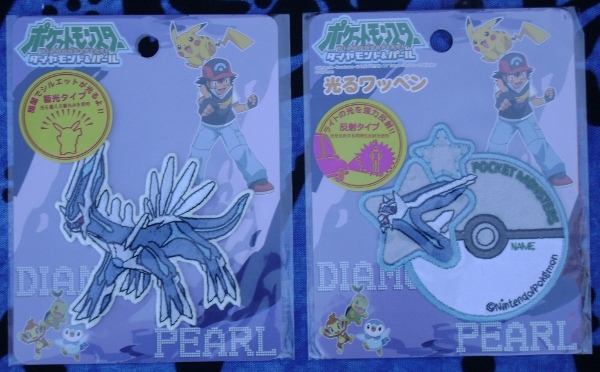 We found them in a random sticker auction lot on Yahoo Japan Auctions. 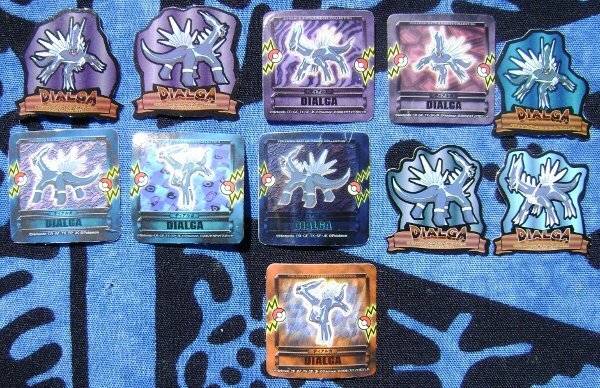 These are some pretty rare stickers! 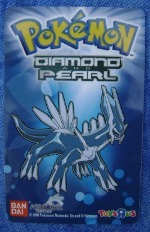 Like many other Pokemon stickers, they came packaged with some kind of gum, just one sticker to the package. 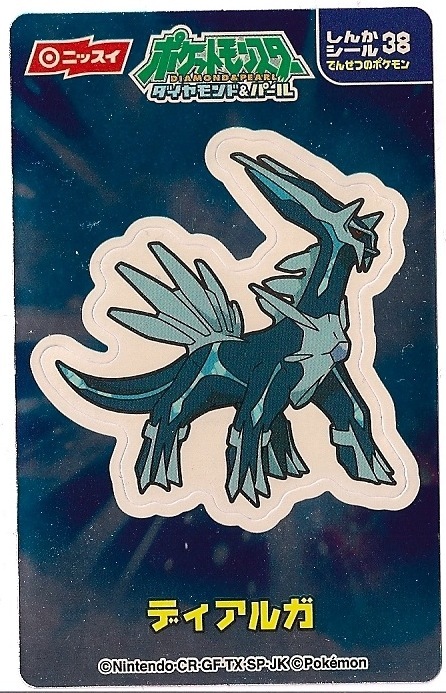 I was very excited to find this sticker listed by itself on eBay with a Buy It Now! 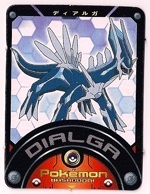 While browsing the gachapon machines at the Pokemon Center, I noticed that this series featured a little Dialga sticker. 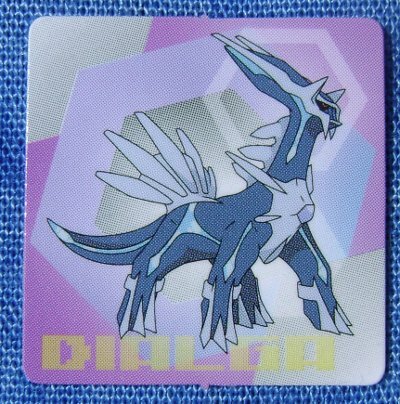 I thought maybe it would take a lot of tries to get one, but I put in the coins for one try and was pleased to see that I received a tiny (about 1 1/2" square) binder with a few dozen little stickers, one of them Dialga! 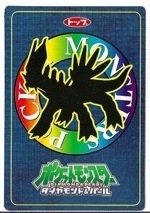 This sticker was included in a Kiri snack package in 2009, as part of the 12th movie promotion. You can see the packaging here - thanks to Asami for the information and photo. Here's another sticker I don't know the origin of, but I'd guess that it was packaged with some kind of food or candy. The back is simply marked as 'Topp' and has the Diamond and Pearl logo. 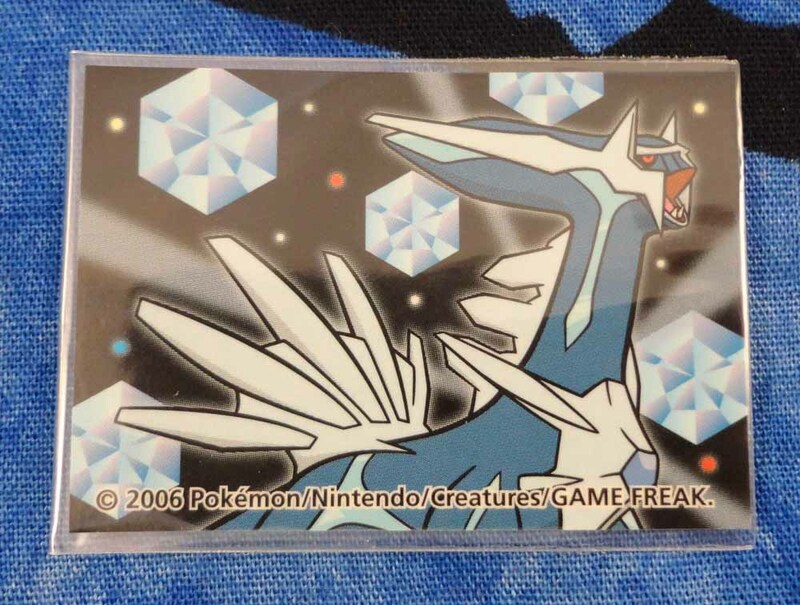 This is a thick sticker to put on your DS Lite to protect it from scratches. 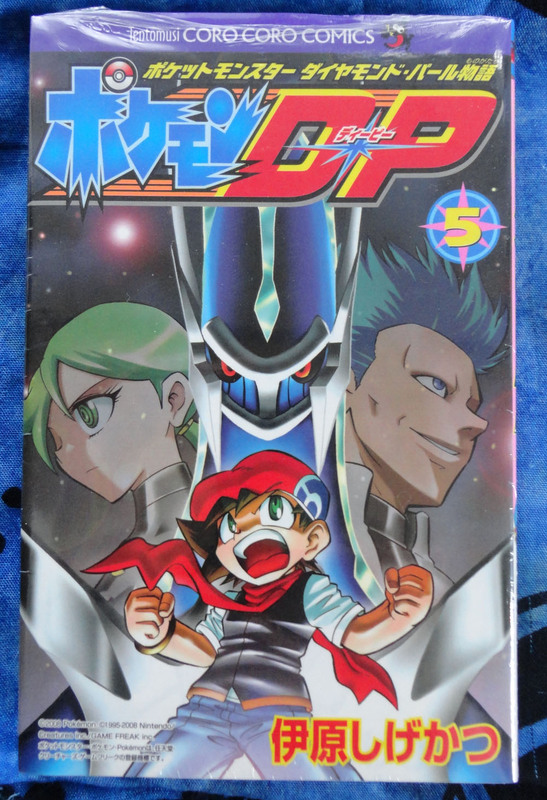 I don't always buy items like this since they're somewhat expensive through Yahoo Japan and deputies, but every once in a while I go through and clear out the flat items I don't have yet. 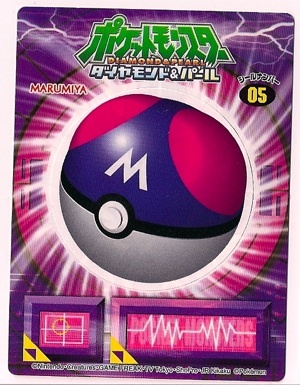 These are distributed through Gachapon machines within Pokeballs - each ball contains quite a few (20-30?) 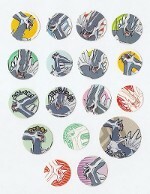 of these mini stickers, with a few duplicates of each sticker as well. I got a few of these from a gachapon machine directly, but most of them came from jedi_amara. Thanks much! A largish and reflective purple sticker. I don't really know anything else about it! 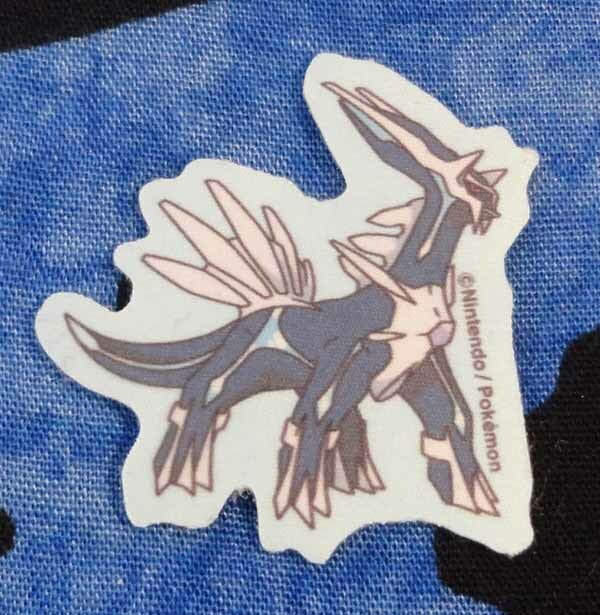 This sticker came in some pack that either my friend or I bought, but by the time I got back to the US, I couldn't remember what it came in. Perhaps some figure or candy set? I had the one on the left for a while, and it wasn't until I got the one on the right (in a lot with many others) that I discovered what these are. 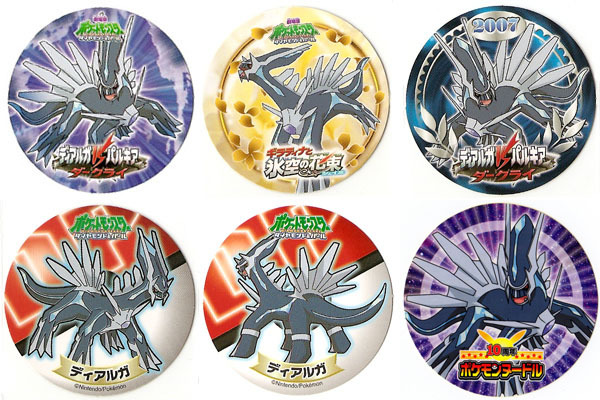 Somewhat like the Marumiya stickers, these come unpeeled (probably with some food product), and you have to peel off the top layer or hold it up to a light to see which Pokemon it is. 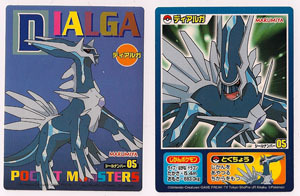 Here I have one from Series 1 and one from Series 2, and you can see some unpeeled ones here. As far as I can tell, this is a large (4" tall or so?) stuffed sticker. 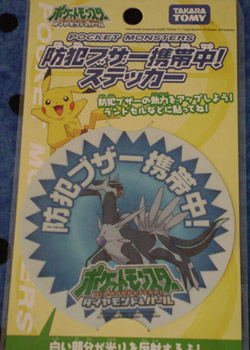 This sticker is one of the promotional items Nissui (a Japanese food company) includes with their products. 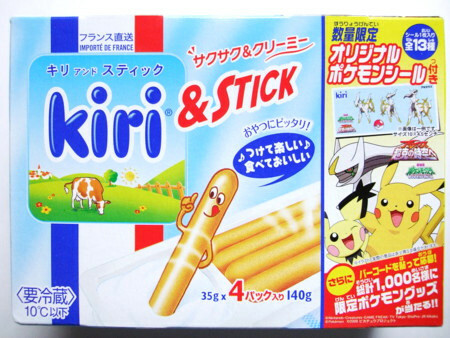 This one is from a Pokemon Sausage series! 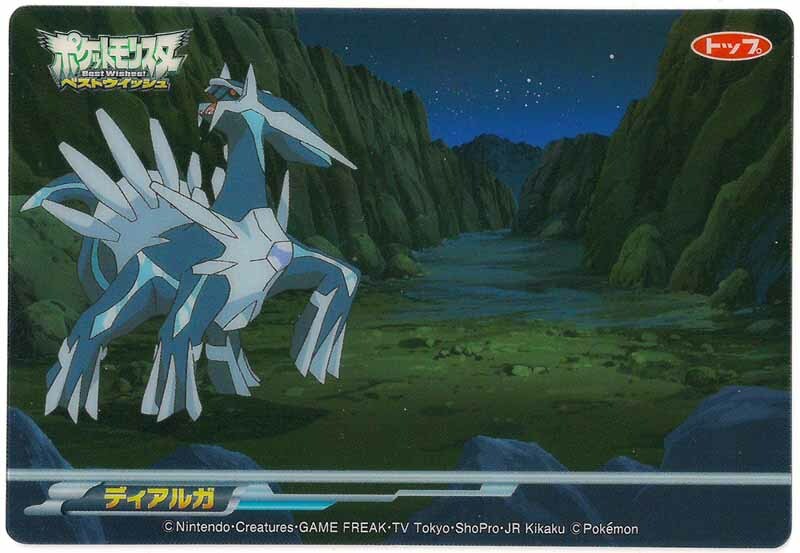 For reference, the back of the card is shown as well. 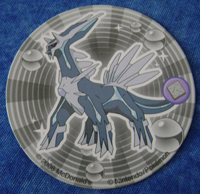 This sticker was distributed the same way as the above, but is from a BW set rather than a DP one. 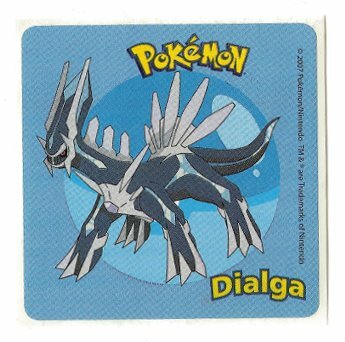 It's called a Double Seal because there's a completely different image on the top and bottom - this one had Totodile line stickers on the top that I peeled off to review the Dialga below. These are part of a large sticker series, and I'm still missing several! 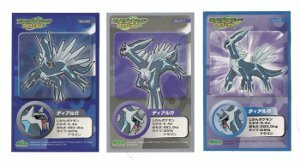 The ones that have borders in black (#053, #161, and #205) are holo versions, which are harder to come by and as there are only so many per box. 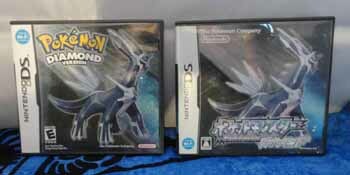 This is yet another of those series that seem to have stats for some kind of game, but I have no idea how to use them! 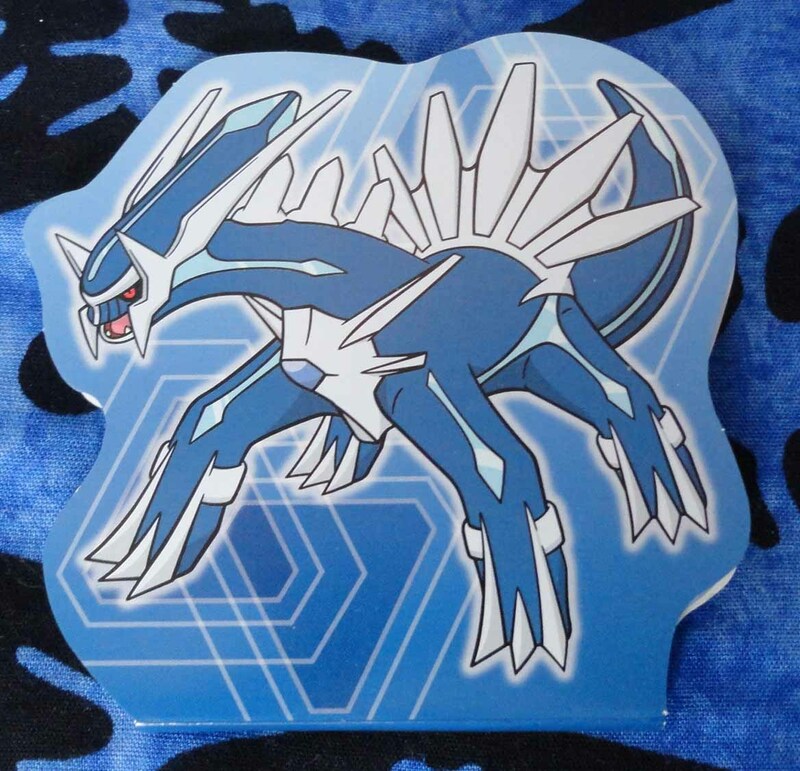 This large sticker (about 5" long!) was a freebie from pheonixxfoxx with another item I purchased. Thanks a lot! I had this sticker sheet for years and wondered what it was from, since I never saw another...but then I realized that the markings and size are consistent with the sticker booklets of the type shown below, and the seller just took this out of the 10th Movie sticker booklet to put it in the Dialga flats lot I bought. Works for me! 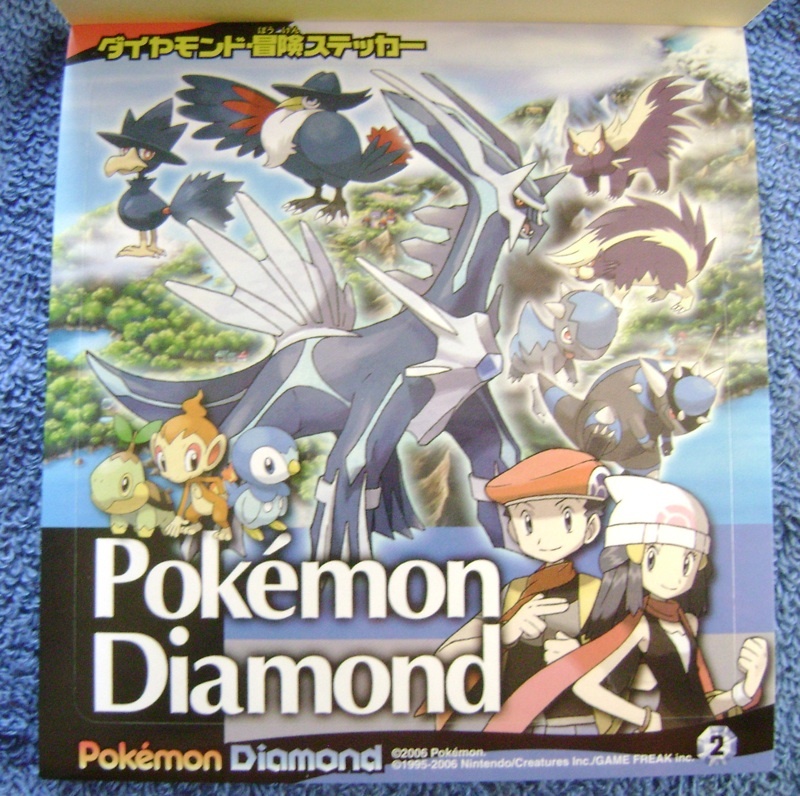 This is the same type of book as above, but instead of including all the DP Pokemon it focuses on Pokemon Diamond. 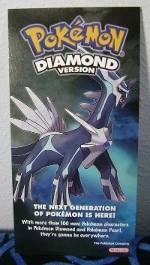 Score one more for my Diamond version collection! 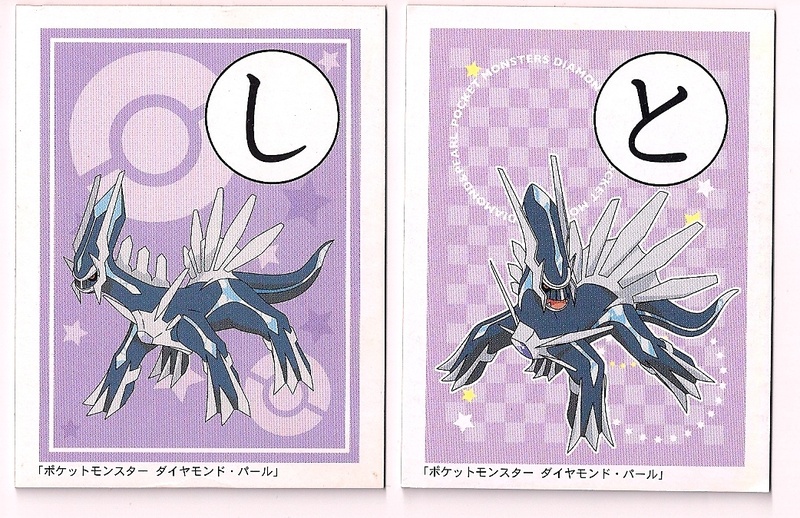 These are from the sticker book shown above. 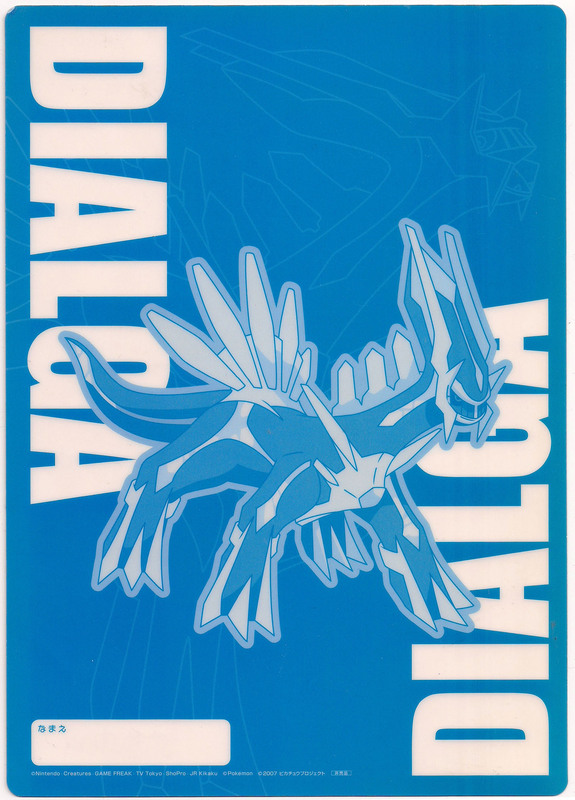 There are more pages in the books, but I just scanned a few of the Dialga-centric ones so that I don't get excited over them and try to buy them if they appear singly later! 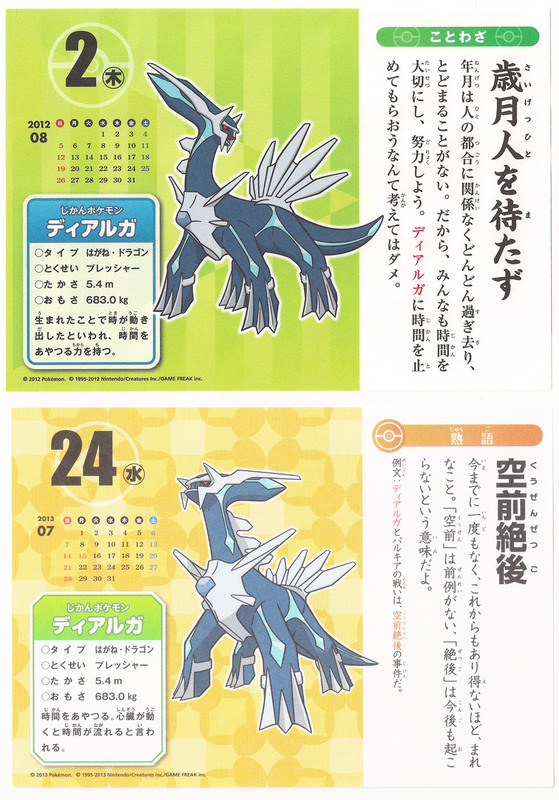 This is the first part of the Pokedex, showing the Pokemon in Japanese alphabetical order, and only goes up to Numel (ドンメル). I suspect there is another version with Palkia that continues the set. 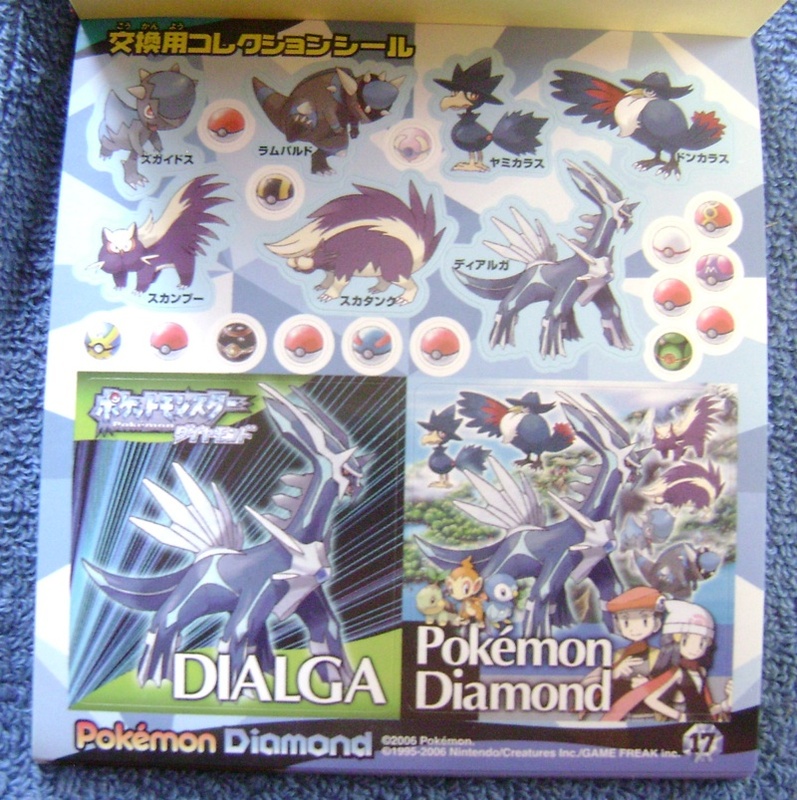 Just as with the Pokemon Diamond stickers, the Dialga version of the Pokedex (shown above) has a Dialga page, so I wanted to note it here for reference. This sticker is to accompany the security buzzer (shown here) so that the buzzer itself doesn't need to be used as often. It warns that this person is carrying a security buzzer. I've seen the pair together often on backpacks as a set. 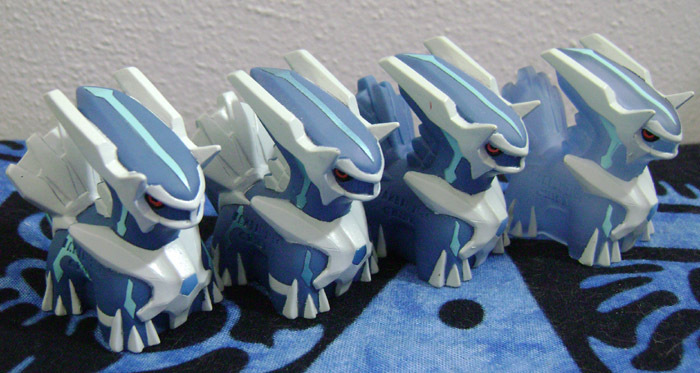 A few of these were free gifts from ridi with the charm I bought from her. 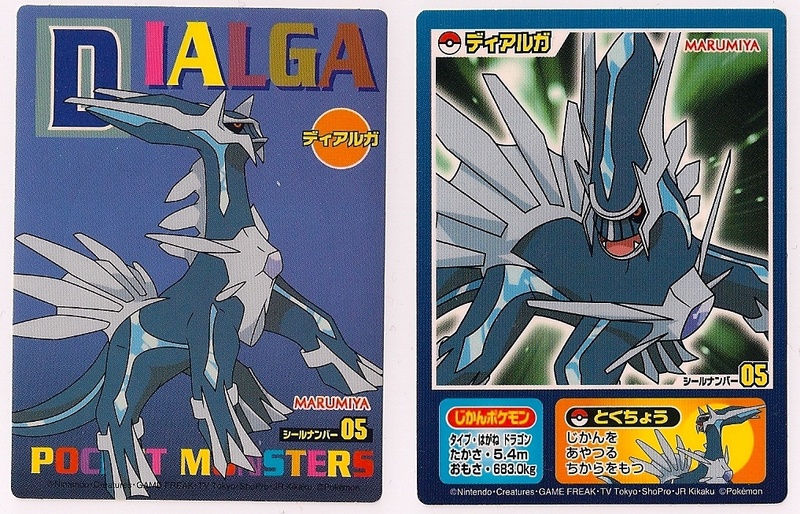 Others are from the 2008 and 2009 'manly' sticker sets. 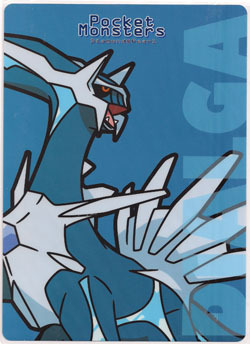 This is a big textured sticker, about the size of a Bromide card. It also glows in the dark (and has that unfortunate glossy backing that pan stickers have, which seems to make it a dust magnet). 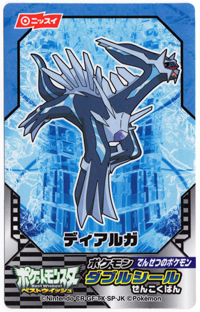 This is quite similar to the above, but is from a completely different set. 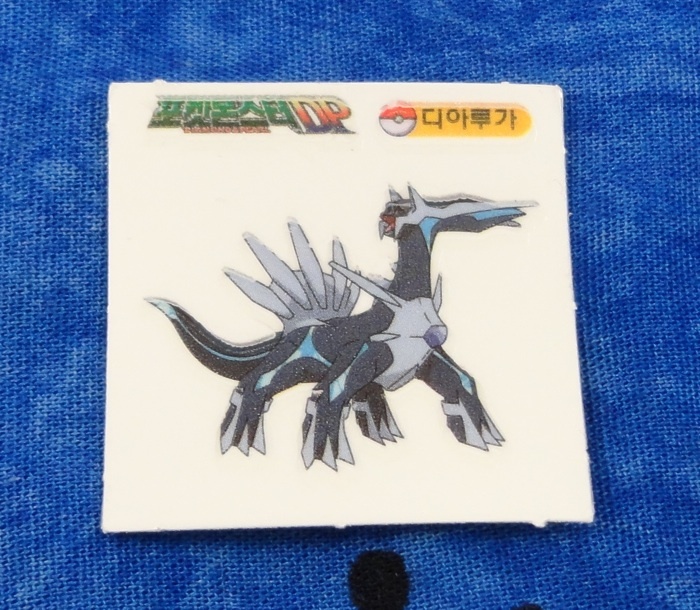 A Korean set of blind-packed rubber eraser Pokemon figures are accompanied by blind-packed stickers like this one. 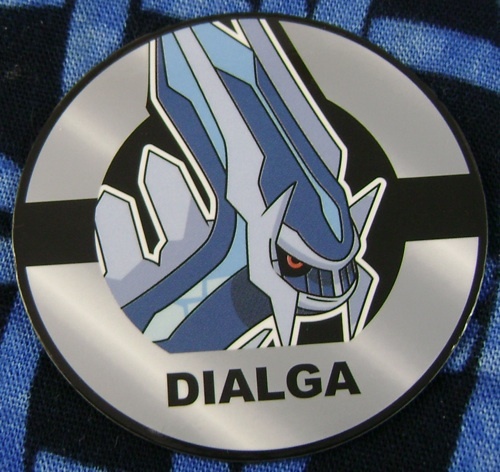 A few people found the set, but they never pulled the Dialga sticker, so I was missing this one for a while...until mamoswine got one and offered it to me! Thank you! 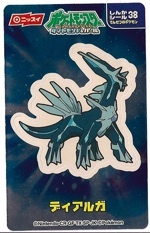 Another little mystery sticker! 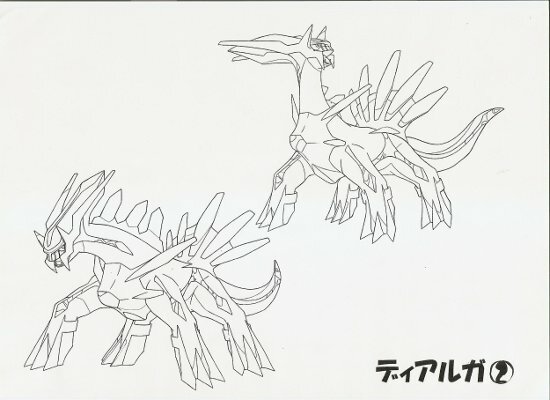 This one is pretty small, so maybe it's from some gachapon set. 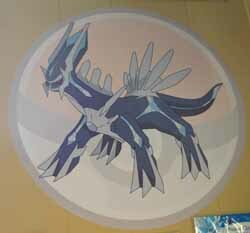 A very large sticker you can use to decorate your room! 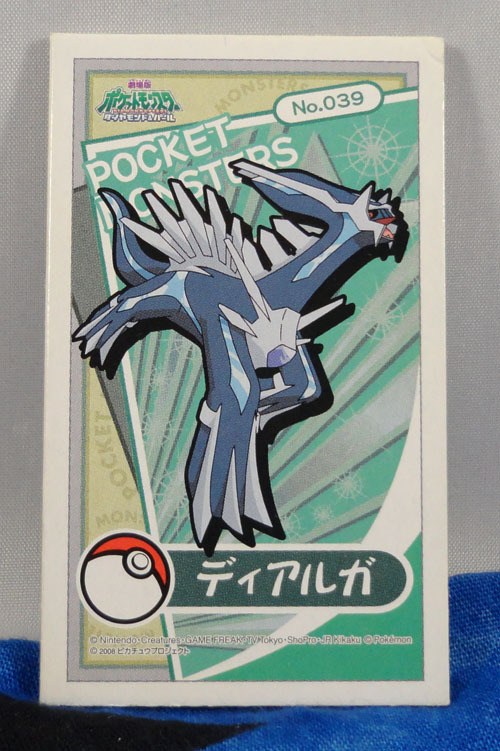 This sticker came up from an Australian seller on my searches on eBay, and I've also seen it in an Australian friend's collection. Maybe it was only released there? 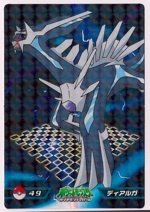 I won this banner in a community auction, and I couldn't be more pleased with it! I was actually expecting it to be made of paper, but it's made of cloth like a wallscroll. 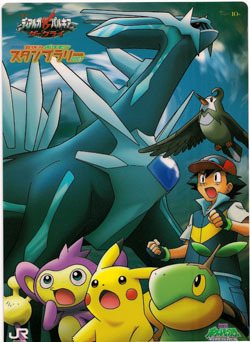 When I first saw it, I hesitated a little bit because it's got Dawn and Piplup so prominently, but then it struck me that it was a promotional item probably not put out for general sale (or at least that's what I'm guessing, since it says 7-11 Pokemon Fair 2007), and that there is probably a Palkia and maybe Darkrai counterpart. Then, I had to have it! It looks pretty crooked in the picture, but it's actually wider at the bottom than the top! It's also quite a bit bigger than I expected, so for now it's on the wall opposite the rest of my collection. I'll be sure to find a good spot for it once I move! 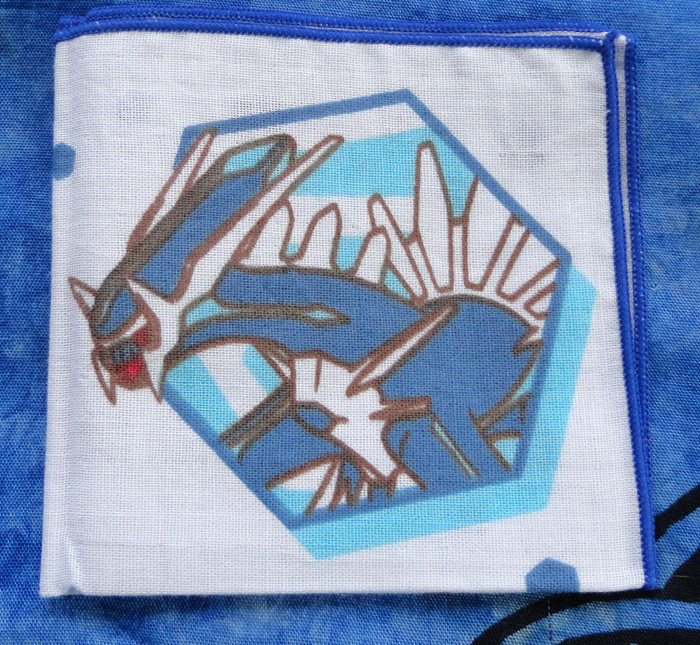 I have a few Dialga hand towels, but this one is a bit different - it's much thinner and is meant for just wiping your hands at the table with a moistened cloth before eating at a restaurant (as is done in Japan). I'd never seen these until Crunch found a set and kindly traded them to me! 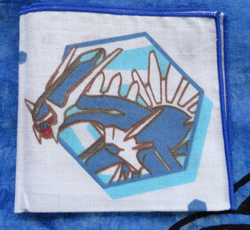 Well, this handkerchief actually has Palkia on it too, but it folds up naturally into fourths, making Dialga completely visible and Palkia not at all so. It's also likely to be a rare old Pokemon Center item, so I decided to make an exception and add it to my collection. 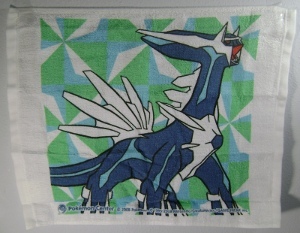 This washcloth is a different type than the one I found in Japan. Maybe it's a bit older? I first grabbed this patch thinking it was just another Wappen, although it doesn't have the name on it. When I inspected it more closely, though, I noticed that it states the border lights up. A quick test confirmed that this means the border glows in the dark - how cool! I'd thought that these were Wappen too because the backing is so similar, but they're much thinner and a different shape (although I guess they're still Wappen since they've got the "It's simple! Attach with an iron!" message in the corner). 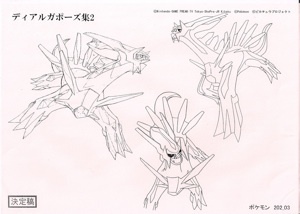 I'm not sure how old they are, but I'd guess the running one is from 2009 because that pose saw a lot of use during the 12th Movie promotion. I purchased this shirt quite a while ago from the now-closed US Pokemon Center website, back before I was really into Dialga. It's a good thing I did, because it's pretty hard to find now! 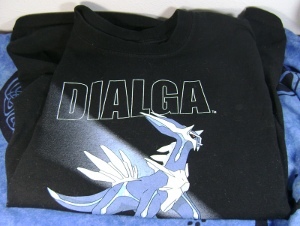 This is one of only a few Dialga shirts I know of that comes in adult sizes. The Dialga and Palkia edition DS Lite was sold as a limited release on the PokemonCenter.com website, but some after that it was also sold at GameStop with a few freebies, such as this shirt. 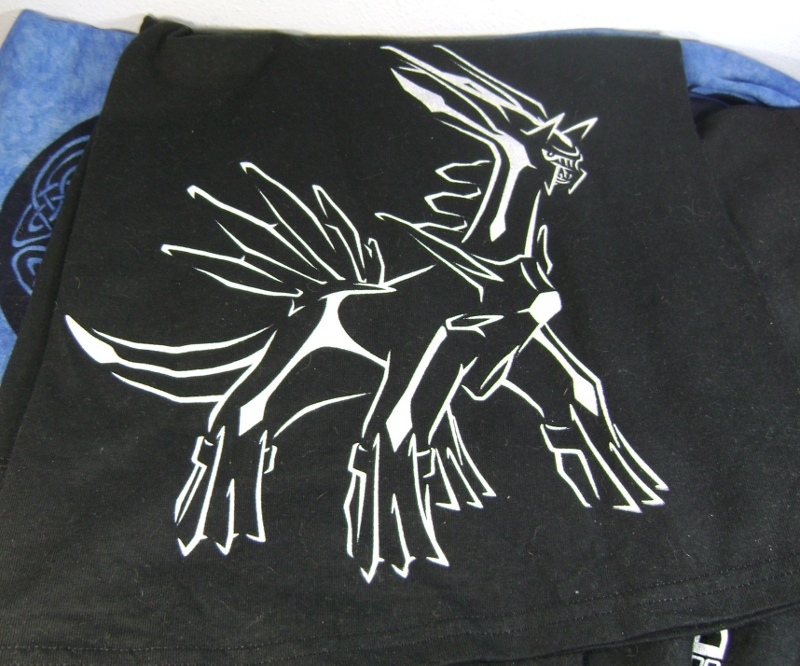 I already had the DS from the first release, and I wasn't going to buy another just to get the shirt, but I lucked out and found it for sale on the community! 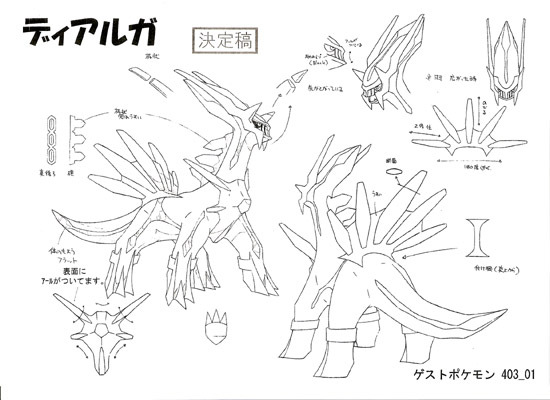 The back features Palkia. These might actually fit, but I'm not going to get them all dirty! 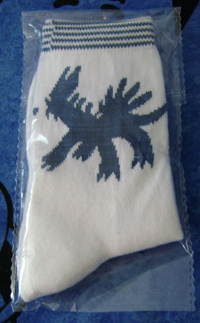 2 more variations on the sock - an 11th movie one and a generic DP one. I have an extra of the generic that actually (sort of) fits! I could wear this when working out! But I won't, because I'd rather keep it clean and pretty. This opens up if you soak it in water into a full-sized mitt - well, a mitt without a thumb. I've left it in the package rather than use it for showering. This is a gift card that was a freebie with the purchase of a game a few years ago. I don't know if it has any credit on it (or if it still works if it does), but it doesn't really matter to me! Like the above, this is a gift card that had some small amount of credit on it (though it had none left by the time it reached me). A random eBay find from a seller in France! This card was actually left behind by a previous guest who was staying with Gin, the owner of Sunyshore. It was wrapped in plastic when she gave it to me, so perhaps it came in packages of Kellogg's cereal? I actually got this card back in September 2008 with the Manaphy giveaway at Toys R Us (at least I think it was Manaphy), but it was in my purse since then so that I'd forgotten to add it to my collection! 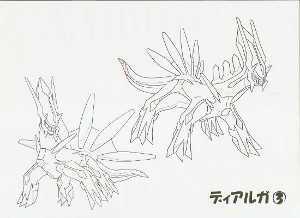 If shown straight on, it shows Palkia, so I have it at an angle here. This card features 4 different Dialga images, 2 for each way you can tilt it. 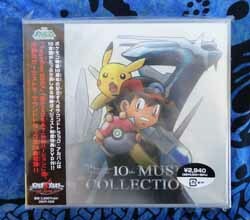 It's marked 2009 Takara Tomy Arts, and also mentions the Pikachu Project, so I'm guessing it's a 12th movie promotional item. 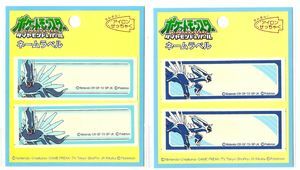 Once you've had your fun with your Pokemon bath crayons, you can keep the plastic card that came along with it as a reminder of the experience. 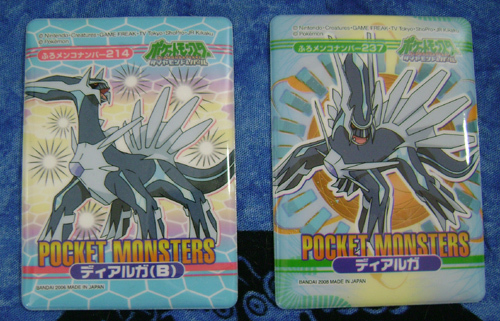 One of these I found tucked inside this, and the other was received as part of a trade with Crunch. Sadly I don't have the crayon that came with the second one, but I think there's little chance of finding it now! This item was on my wanted list for a long time, as an item I'd missed once and then couldn't find again. 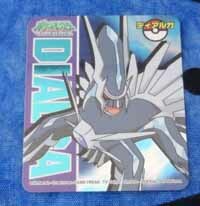 It's a little larger than a TCG card and made of clear plastic, and looks quite nice! 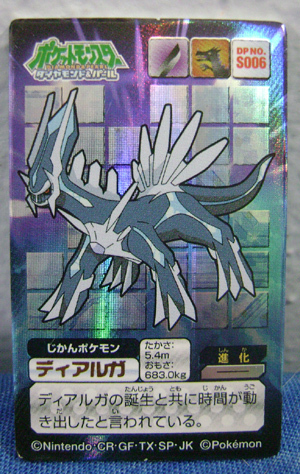 Thanks to my friend crunch385 on pkmncollectors, I now know this card is from the Subarudo 'Pokemon Gallery' set! 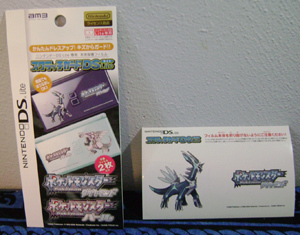 Here is a picture of the packaging and here is a picture of the set contents. 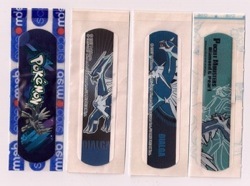 These plastic cards were included in packs of Subarado's Pokemon Ramune candy. This is just like the above set, but since I got it still in the plastic wrap, I now know that it comes with two little stickers. I wanted to feature the cards and stickers together, but since I found all the others loose, I don't know which mini sticker goes with which card! 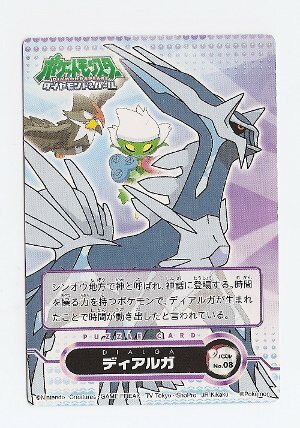 This came as part of a set with Darkrai, Palkia, and cards with all of them together. 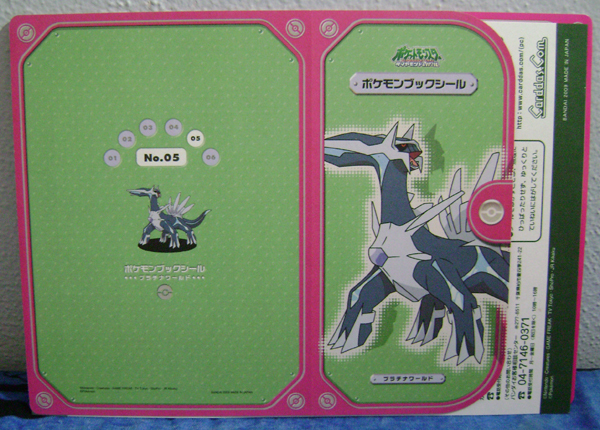 The scanner doesn't show it, but it actually has a clear plastic background. 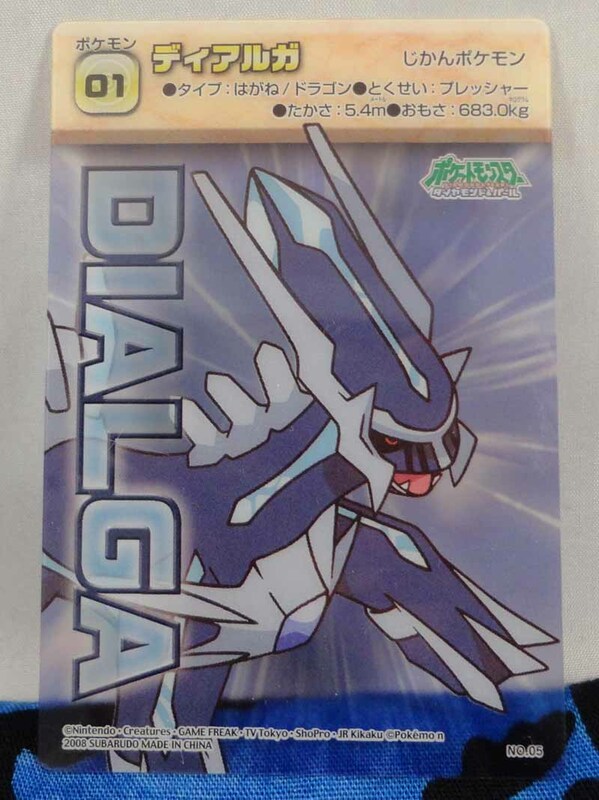 I wish that I had a more descriptive name for this, but the packaging itself just says "Clear Card Set", so that's all I get. 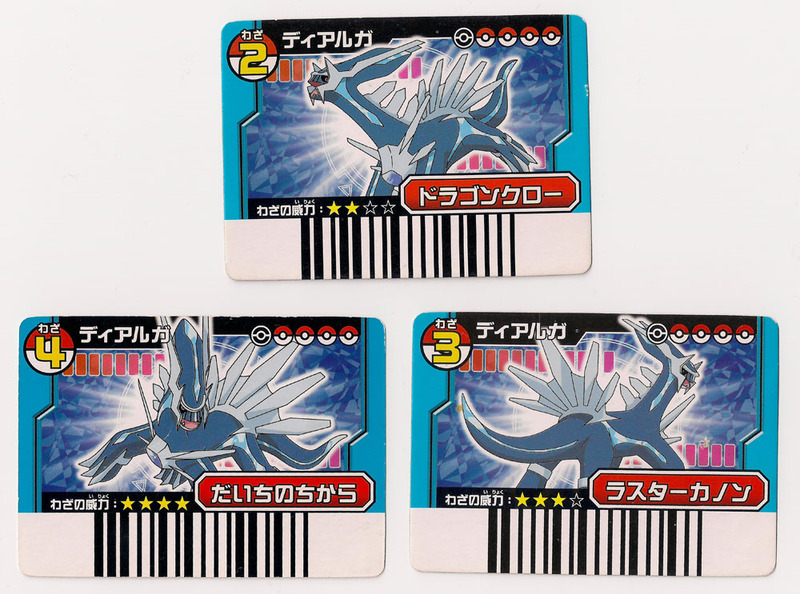 These cards (not to be confused with the American Topps cards) feature glow in the dark images of the Pokemon on the back. 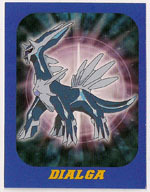 I have a Jolteon in this series as well! 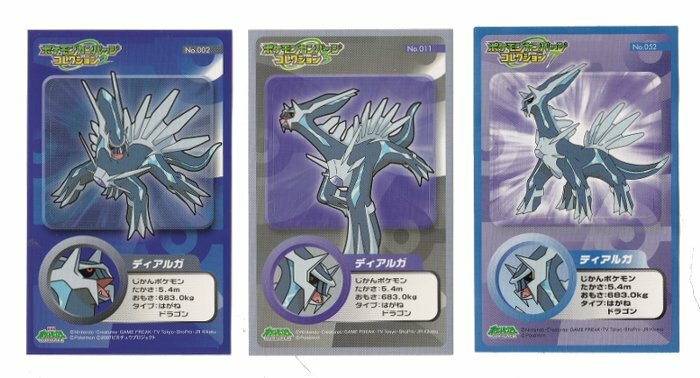 This looks much like the above cards from the front, but the back is just plain sticker backing instead of a glow in the dark image. 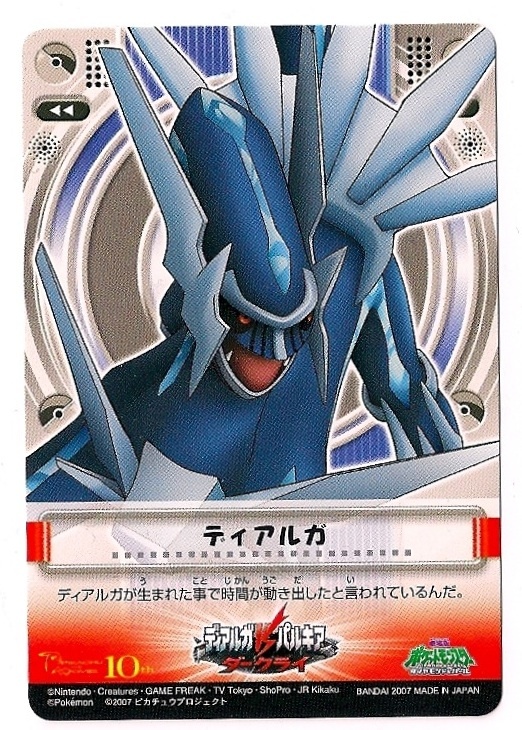 Anyway, this card is from a set that comes with a lottery-like scratch and reveal card, in addition to this regular card. 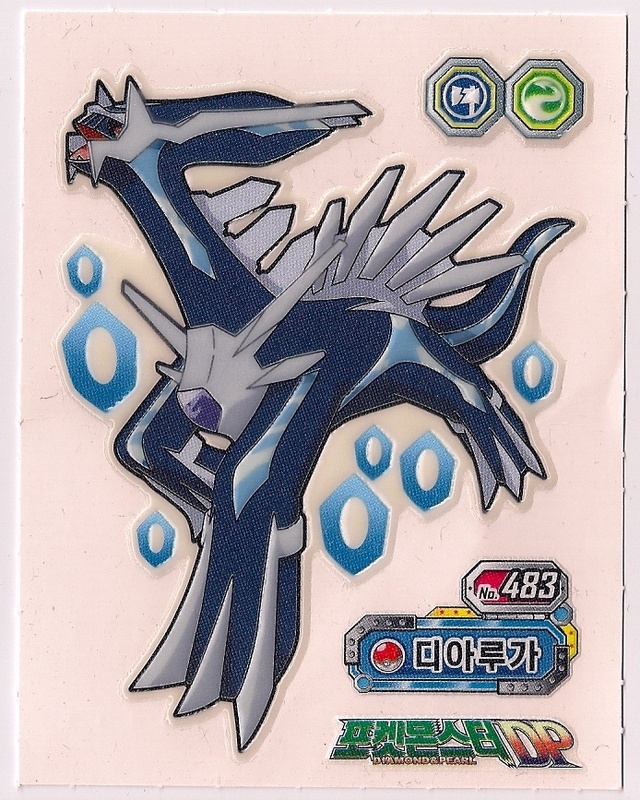 I spent a lot of money on packs trying to get this card before eventually getting one in a huge flats lot! 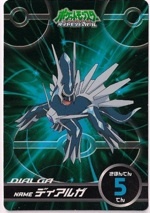 Despite the similar design to the above card, this is the only one I have that says 'Scratch Battle Gum' on the back. 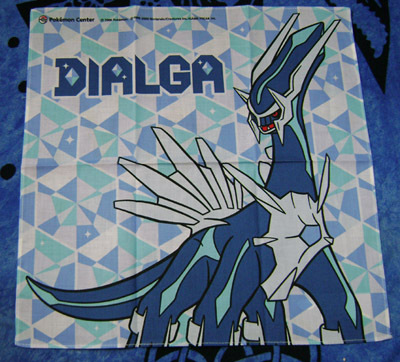 Are there more Dialga ones out there, though? 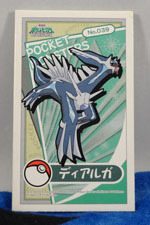 Here's a lovely Topp card that I'd never seen before, then got two of at once in a big lot! 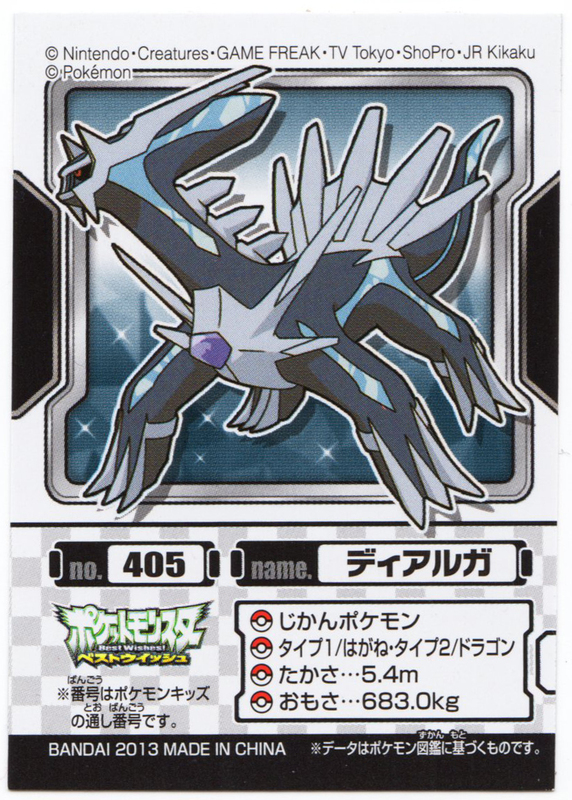 It's got a nice sparkle to it that my scanner doesn't do justice to. 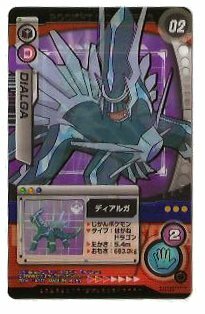 The back of this card shows Dialga, Palkia, Giratina, and Arceus with a red background, so I assume it's from some 12th movie set. 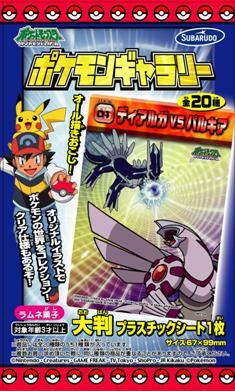 This series features Pokemon performing their attacks (on another Pokemon). 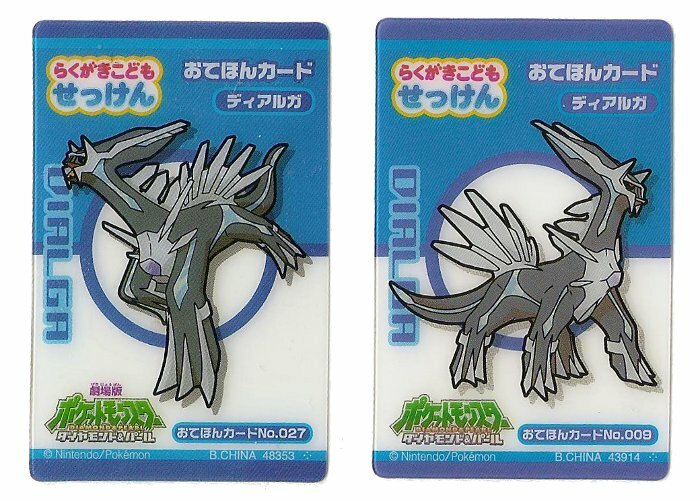 I had the Dialga vs Palkia one for a long time, got the Dialga vs Gyarados one from denkimouse, and then saw that the Dialga vs Giratina one, which I'd not managed to find, was still being sold in Pokemon Centers. After buying some dozen packs and not getting it, on my last trip to the Pokemon Center I grabbed all of the remaining packs on the shelf. There he was! 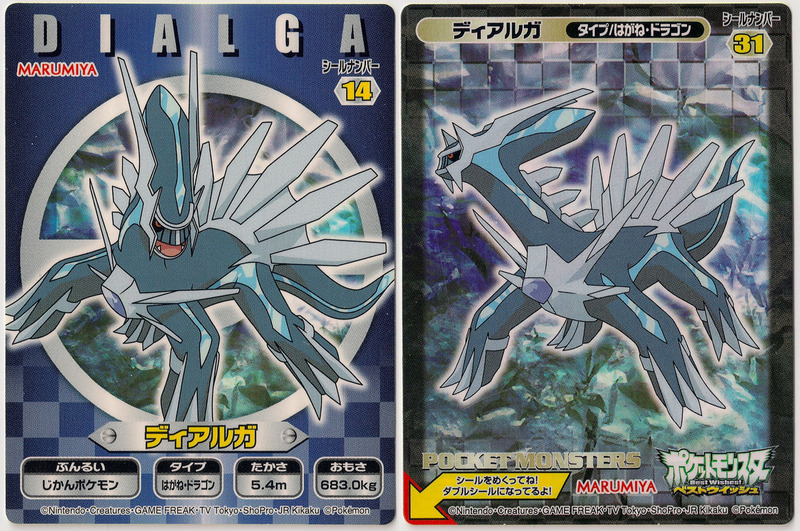 In the second photo you can see the backs (fronts?) 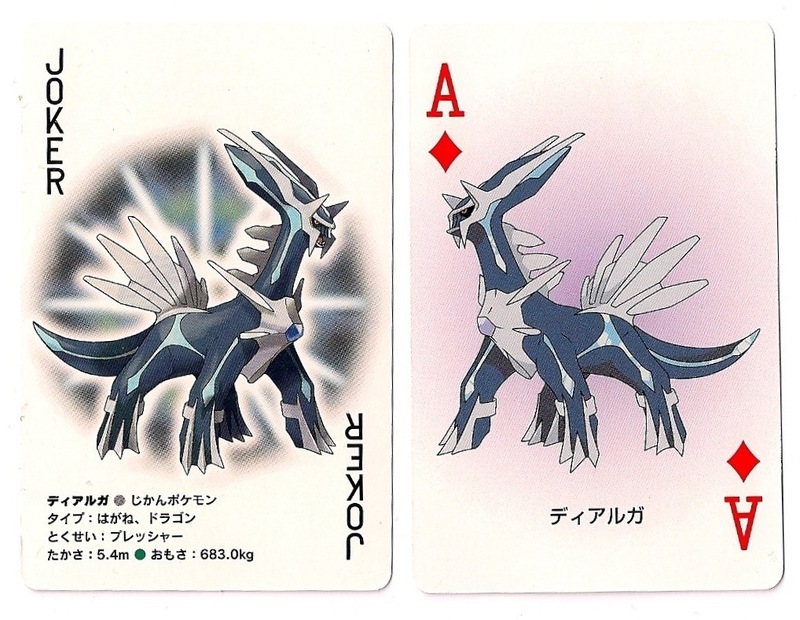 of the cards. 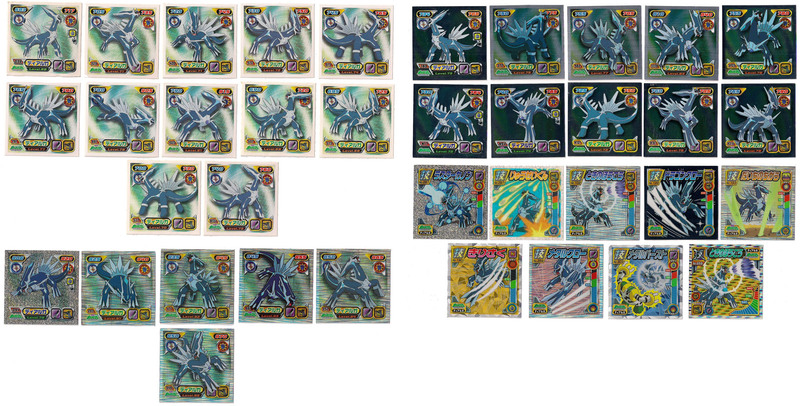 I haven't featured the two with Dialga getting attacked (since those show Palkia and Giratina on the other sides), but since I happened to get them without trying, I figured I may as well keep them and include them here. 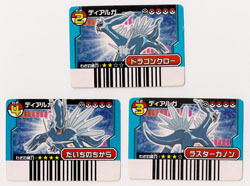 Unlike previous VS cards, the BW series consists of two types of cards: solid background cards and clear top cards. 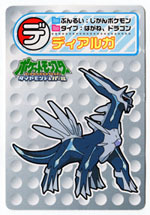 This Dialga base came with an attacking Keldeo, but you could swap in any other attacking clear card. He looks really lost by himself! Cards like these make me glad I have Dialga FTW. 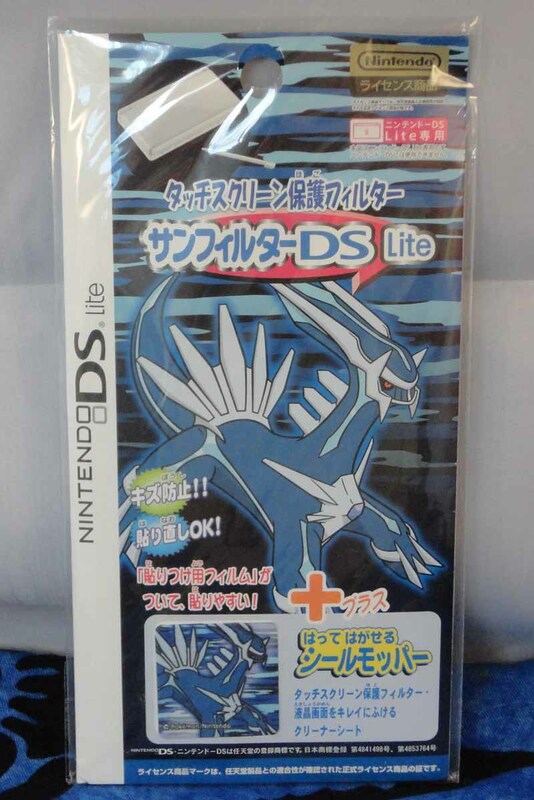 A quick check on the site confirmed that I didn't have this particular one yet, and I happily purchased this without having to go through deputy services and Yahoo Japan. 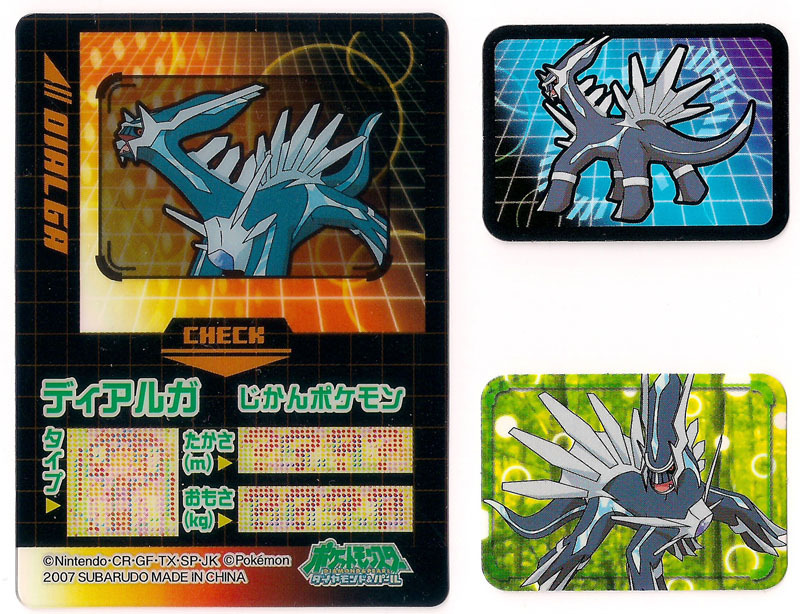 This series looks like some sort of Pokedex data card, and are marked Ensky on the back. 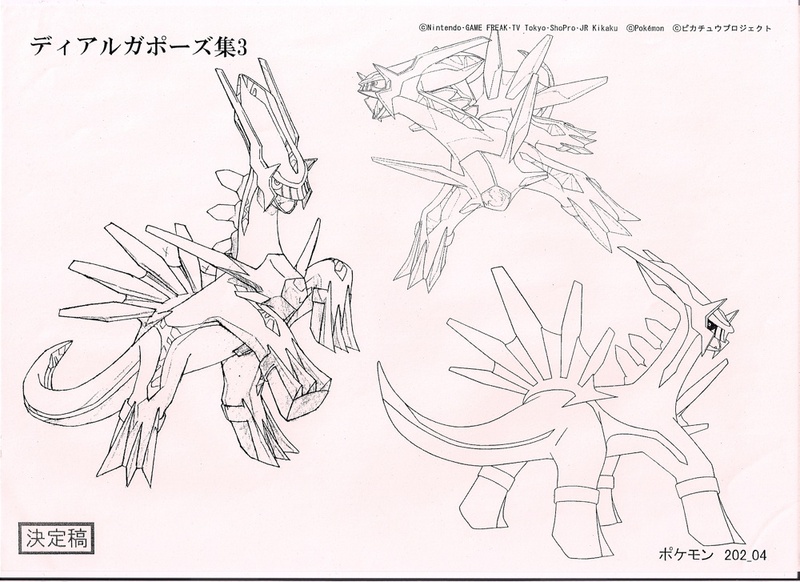 The ones on the bottom right are DX Bromide, and have a reflective shiny surface that neither my camera nor scanner could pick up properly. It's quite pretty, though! 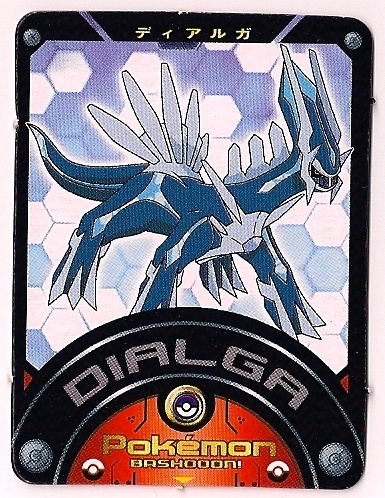 The front of this card has a little bit of information about Dialga, and the back of it has a picture that makes up a larger one when combined with other cards in the set, hence the name. 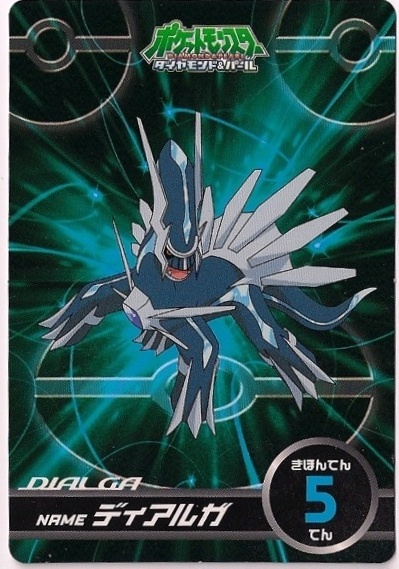 I don't know what と has to do with Dialga, since it doesn't appear in his Japanese name. 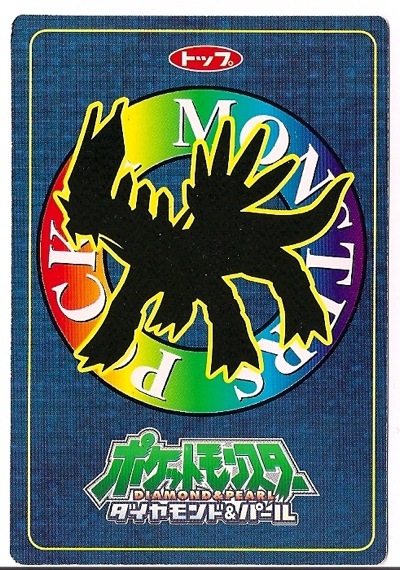 My best guess is that it goes with the card below, and it's taken from the "ときをあやつる" phrase there. And し makes even less sense to me - maybe that's because I'm missing its accompanying card? This one finally arrived in time for Christmas, after agreeing to trade for it about 2 years earlier! The second image shows the backs of both cards, just so I don't mistake them for ones I'm missing. 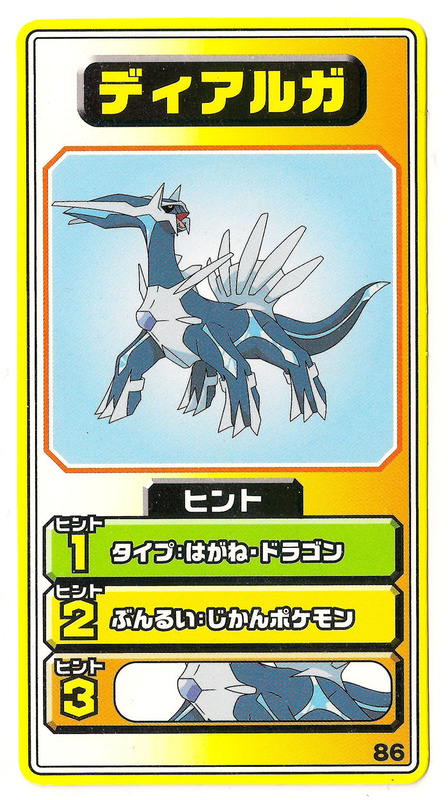 I don't know what this card is for, but it seems to match up with the と hiragana card above. 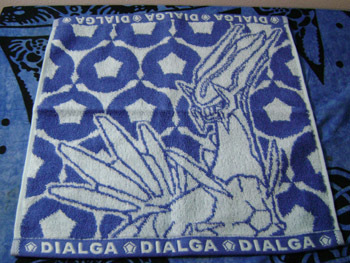 The front (which I didn't photograph since it doesn't have any images on it) says "ときをあやつるでぃあるが（ディアルガ）”　(Dialga, which controls time). 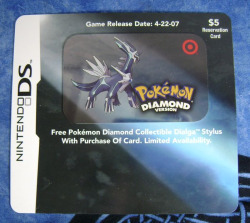 At the bottom it just says Pokemon Diamond and Pearl. 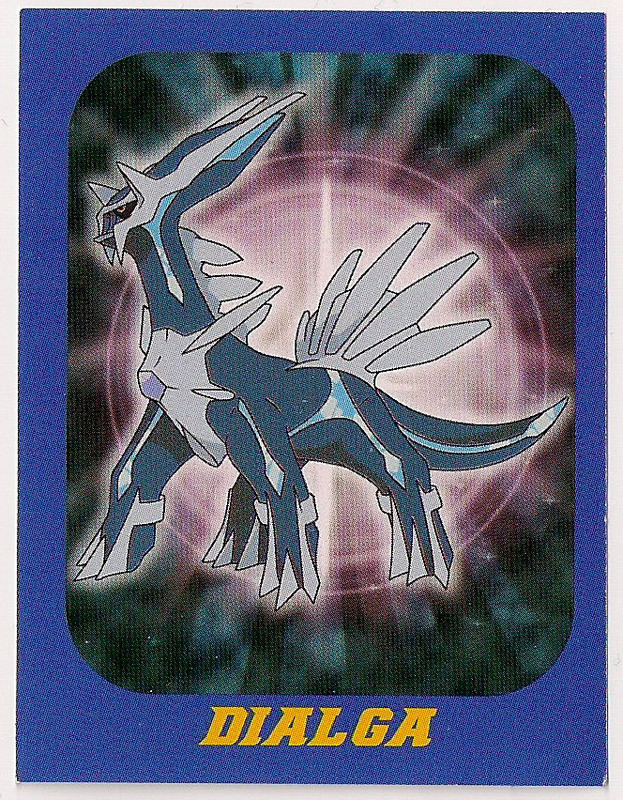 I don't know a lot about this one, but it looks like it came with some kind of food item since it has the Nissui logo on the back. 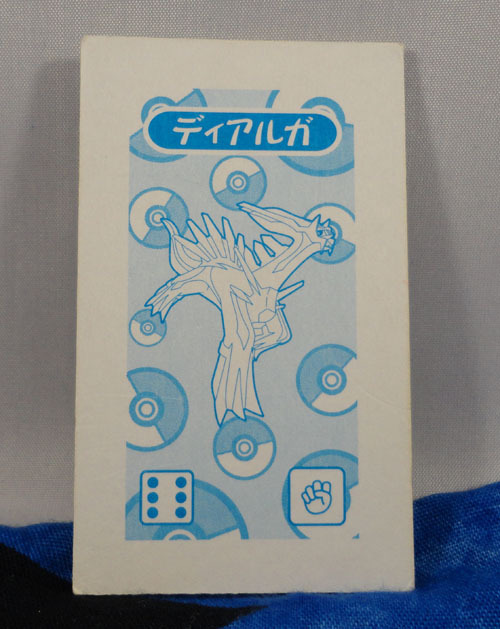 The back also suggests playing Pokemon Shiritori, which is a Japanese game where you try to come up with a word that begins with the syllable the last word ended with. 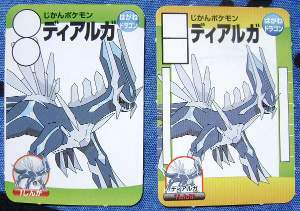 For example, it suggests going from ディアルガ (Dialga) to ガラガラ (Marowak): Marowak starts with the ガ that Dialga ends with. The one on the right was a Yahoo! Japan find. I think I'm missing a few of these yet. 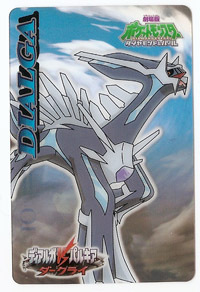 Not TCG cards, but your standard playing cards, featuring Dialga. 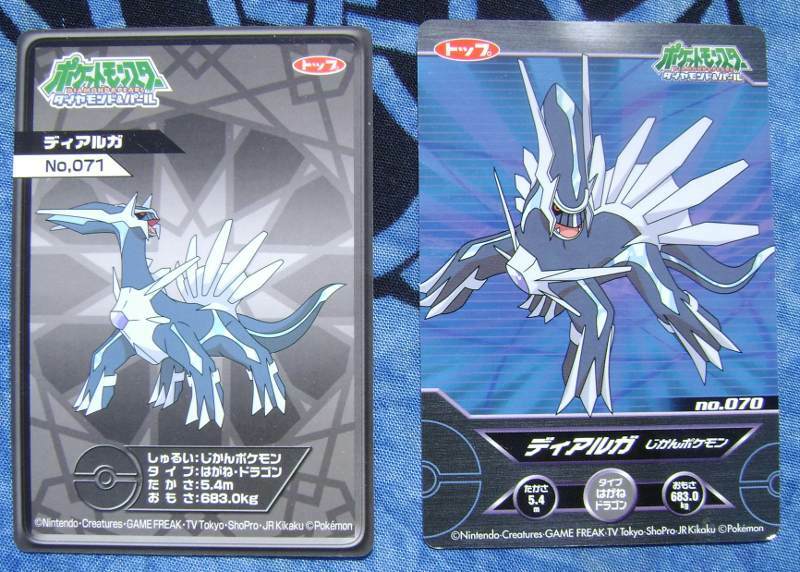 The left card is actually from a Pokemon Diamond deck, shown above. 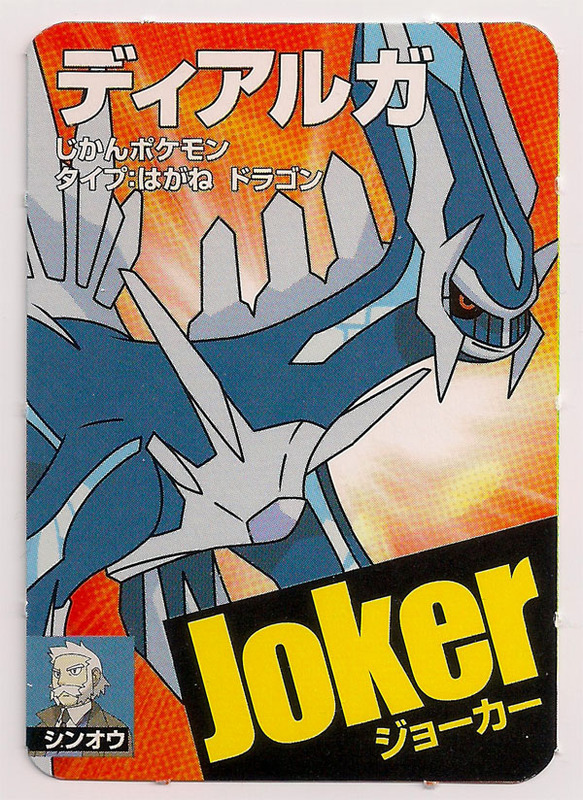 I've had the deck new and unopened for a long time, and then bought the Joker Dialga card separately on pkmncollectors since I didn't recognize him when he popped up - but this way, I get to keep the pack unopened! 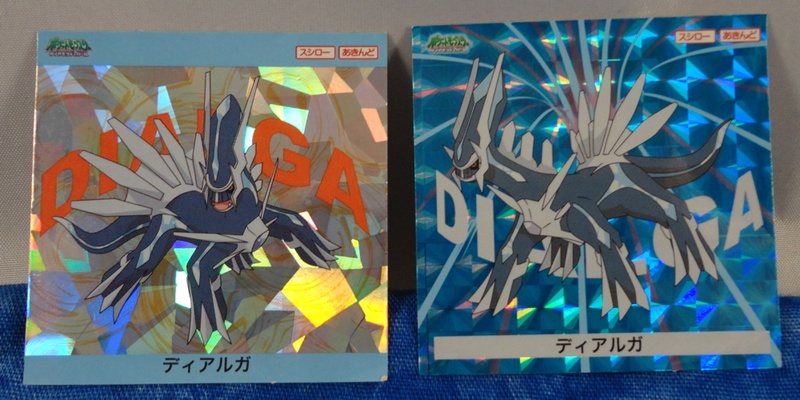 The right one is from a somewhat expensive deck of cards I found in Japan that showed a Dialga as one of the cards on the package. 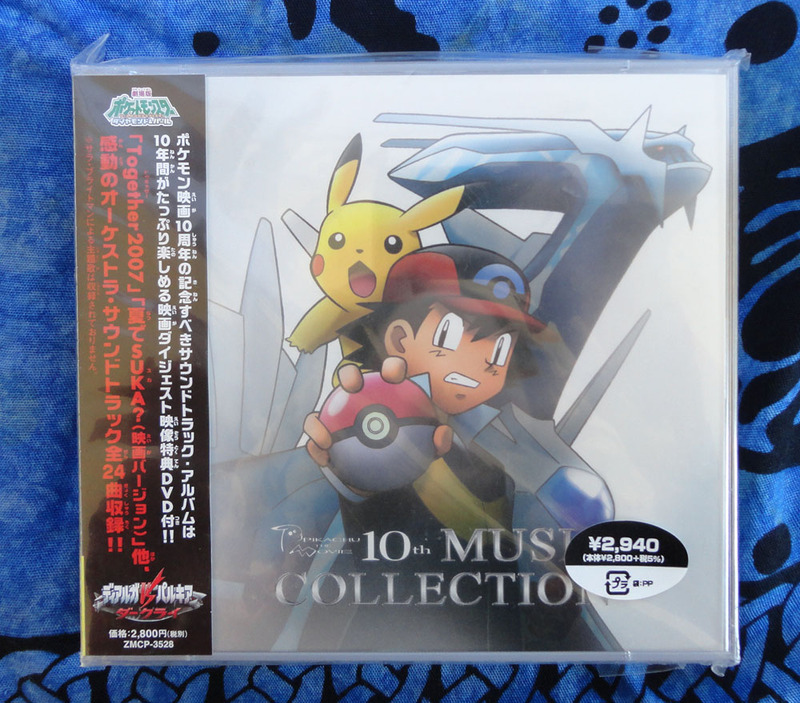 I hesitated before buying it, but I figured that if all of the cards had Pokemon on them, I could probably resell the rest and come out even. Nope! 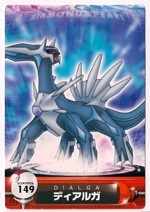 Only the royal cards feature Pokemon, and the rest are just plain cards. Oh well! 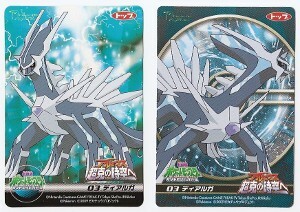 For reference, you can see the backs of both cards here. 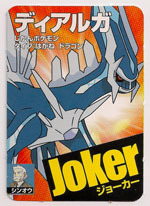 From another Pokemon playing card set, this mini card has Dialga as the Joker, and some kind of association with Sinnoh - maybe the Pokemon are marked by region in this game? 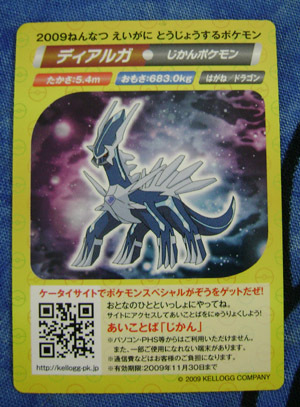 The back says しんかトランプ　小学二年生１１月号ふろく. 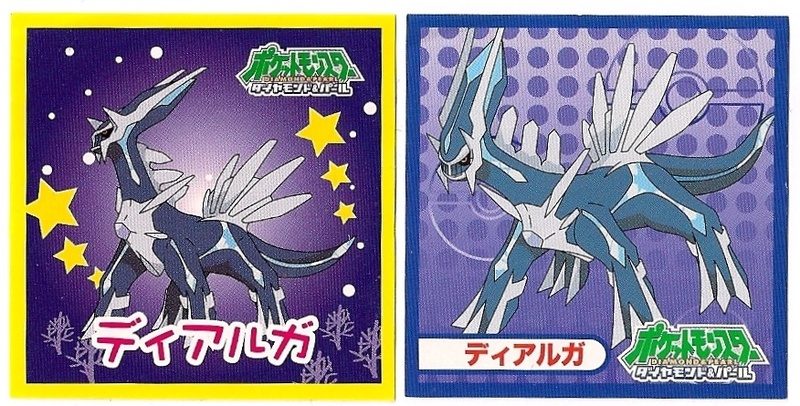 These are from a set featuring a lot of manga-style artwork (and possibly little storylines, though I really only paid attention to the Dialga cards). 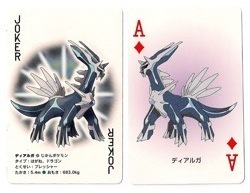 They're about half the size of a standard playing card. 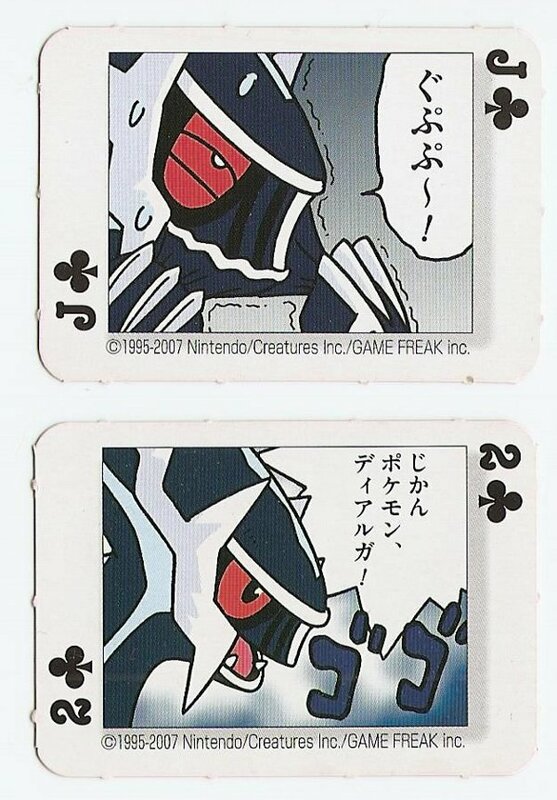 These appears to be part of a much larger playing card set. 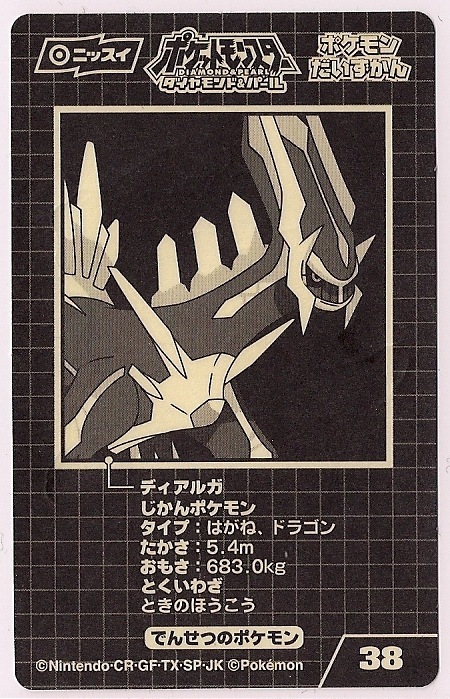 The cards themselves are quite small, though: only about half the size of a normal trading card. 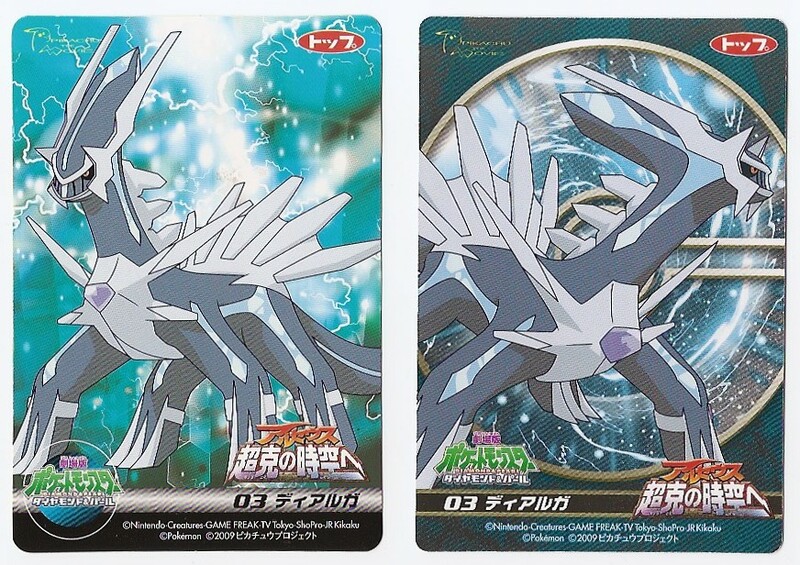 One of these is marked November and another December - perhaps different sets were released each month for a time? 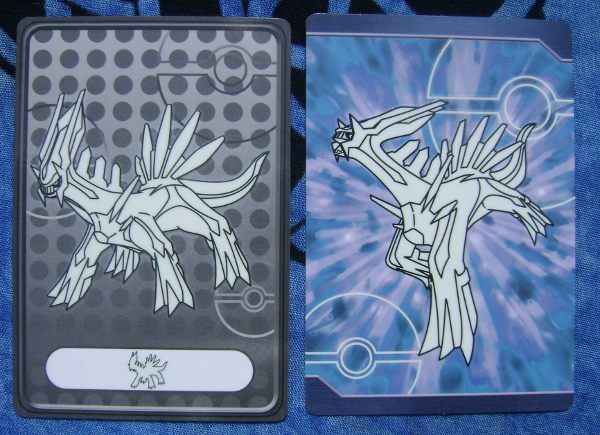 Here is a photo of the back of the cards. 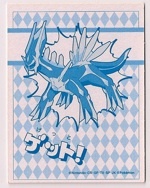 This card appears to be from a Bandai Namco amusement park Shiritori set, and is dated 2007. 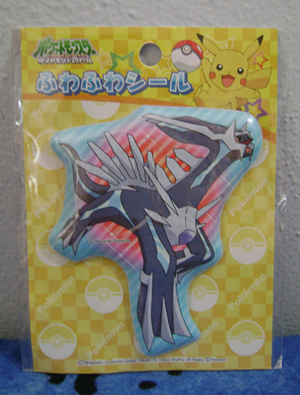 It has the Banpresto logo on it as well. Shiritori is a Japanese game where you try to come up with a word that begins with the syllable the last word ended with. For example, this card suggests going from ディアルガ (Dialga) to カイリキー (Machamp): Machamp starts with カ、and Dialga's name ends with ガ. 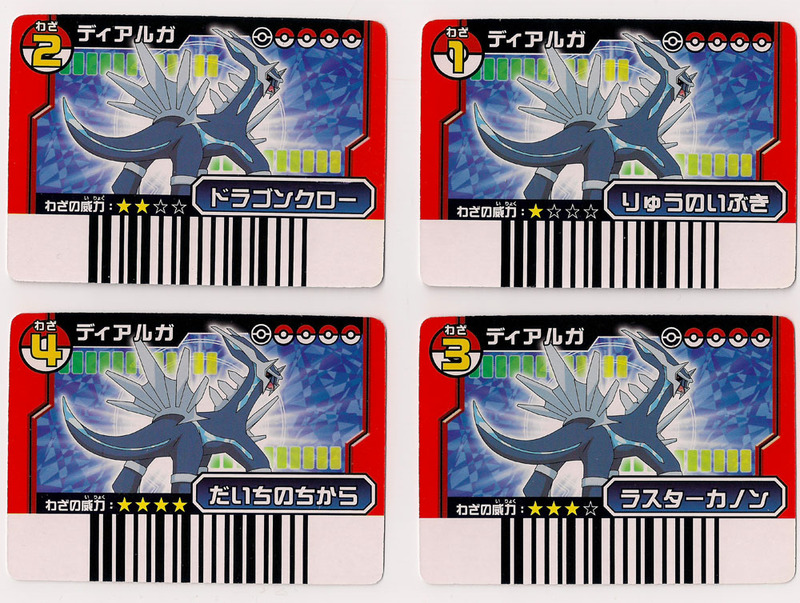 This series appears to have been running since at least AG, and there are cards for all Pokemon up through D/P. 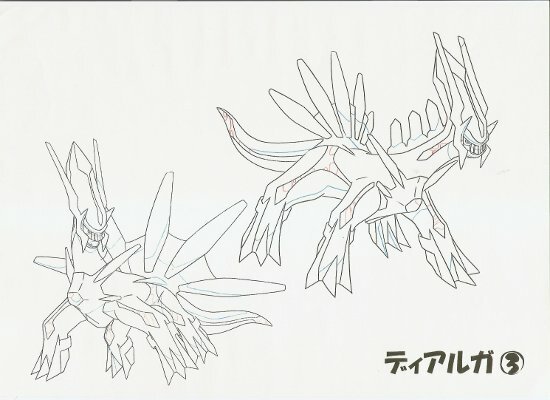 Here's Dialga's! 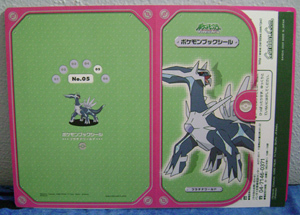 A collectible card that also came with a sticker card and the ShoPro insert. This large hexagonal pog is part of the Bang Bang! 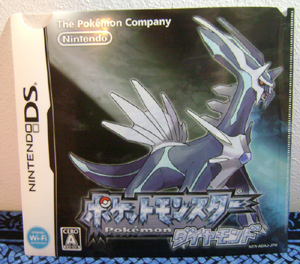 game by Media Factory. 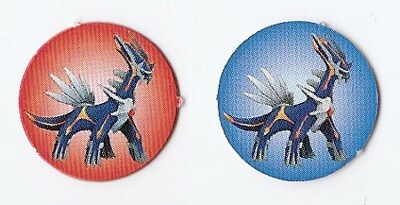 A very large pog, and part of a battle set. Not sure how you play them, but I'll collect these anyway! 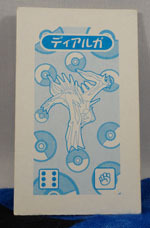 This is part of a game made by Jakks Pacific containing 72 pogs, 2 of each Pokemon in the set. You can either play 'Memory' with them (that is, turn them all upside down, arrange them, and try to find matching pairs), or flip the disc like a coin. I thought the sets were a bit too expensive in the store considering the simplicity of these games, but thankfully I was able to find a box for cheap on eBay! 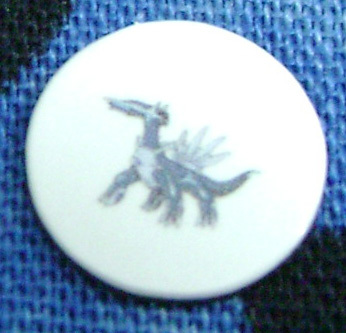 This piece appears to be a marker for some type of (Japanese) game. It can be folded up (as I've done here) to stand on its own. This standee is from a 'marble attack' set made by Bandai and sold only in Europe. 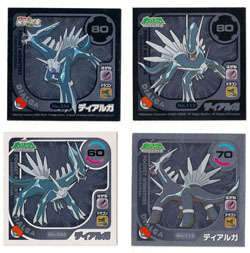 I'm not sure if there are other Pokemon in the set, but I only know of Luxray as the featured Pokemon that received a brand new posed figure in this series. 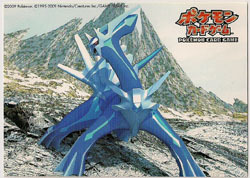 This Dialga (along with the Palkia and Shaymin also included) are meant to be set up as targets to shoot marbles at using Luxray's launcher. 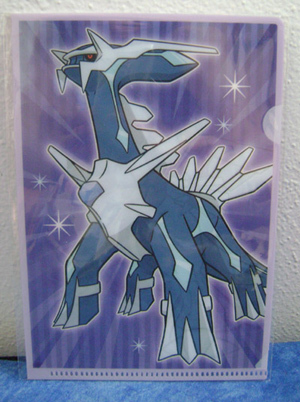 I'd much rather just stand up this Dialga in my collection, though! The actual in-game music - all of it, even short sound effects like the hatching of an egg. 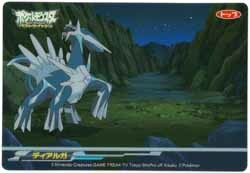 I think my favorites are the Dialga/Palkia encounter music and the Champion battle theme. 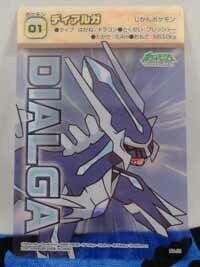 I bought the "Dialga set" hoping there was a figure in it, since I couldn't find any information on Japanese McDonald's Pokemon toys when I searched on it. 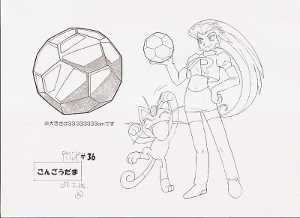 The set has an Ultra Ball that you can clip discs in, and included are Buizel, Gliscor, and several others. 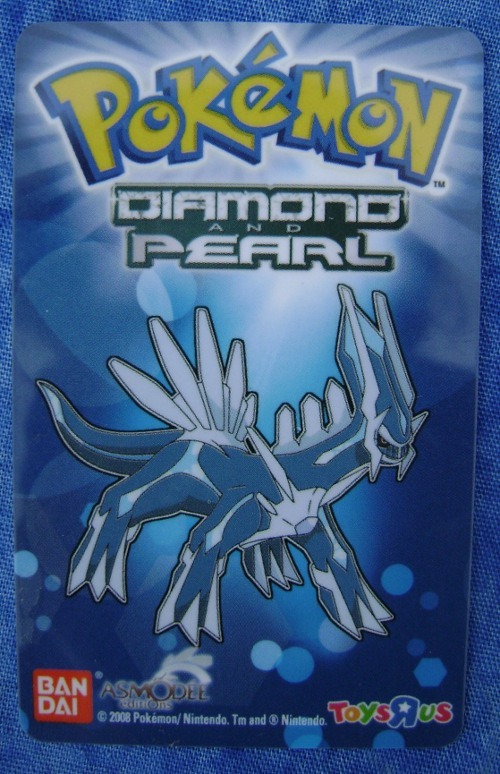 I don't know the origin of these, but I'd assume it was given out at game stores or something prior to Diamond and Pearl's release. They were right, those Pokemon were indeed everywhere! 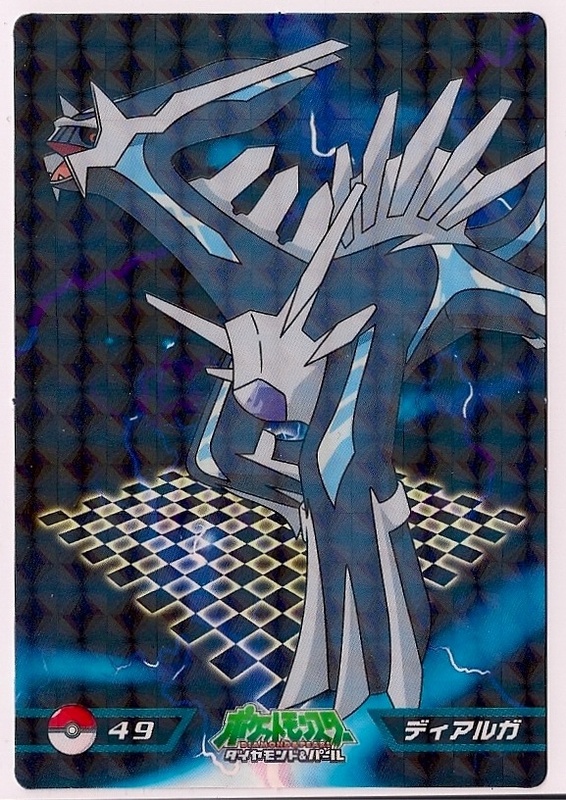 I'm not sure what to call this one as a promotional card makes it sound like it's from the TCG, but it's about that same kind of cardboard and isn't just normal paper. 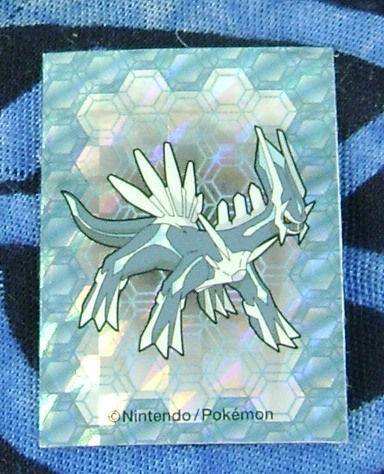 This looks quite similar to the above, but it's a UK-exclusive bookmark that features Palkia on the other side (instead of just information about the games like the above handout). I had this on my wanted list for a little while when fizzycat on pkmncollectors pointed me to this auction, where the bookmark was among a lot of other random Pokemon flat items. Thanks much! The owner of Floaroma gave this to me as a gift one day! 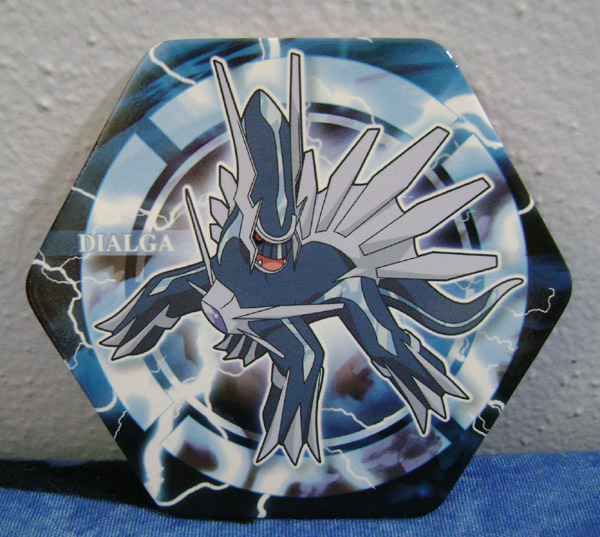 It's about the size of a dime and is one of only two items I have for Primal Dialga (the other being the plush). 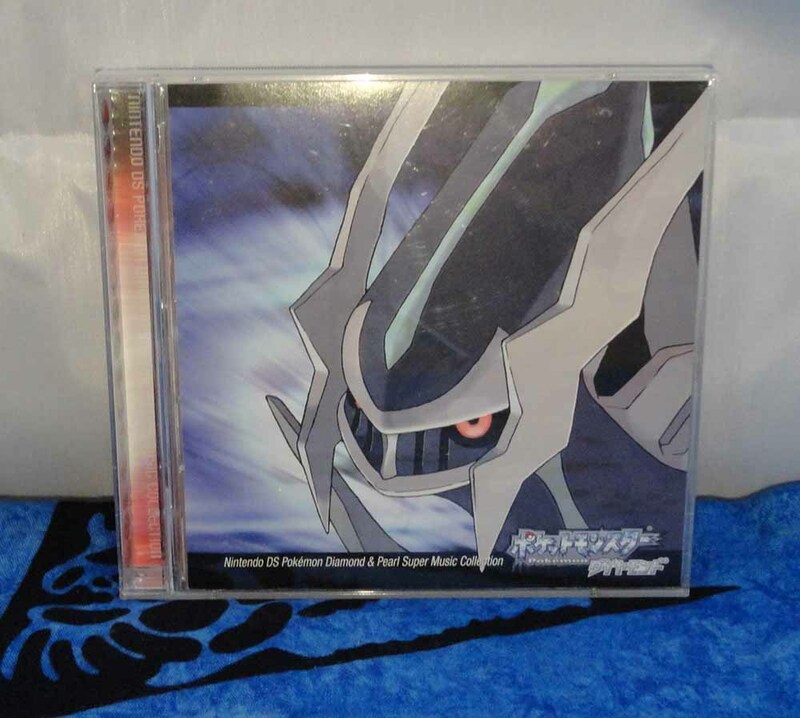 I believe this is the soundtrack for the 10th Pokemon movie (Dialga vs Palkia vs Darkrai), but I haven't opened it up to make sure. 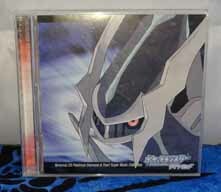 It also says it has a DVD with some bonus content. 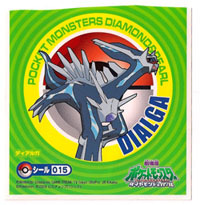 I'd seen this set around quite often, but it took me a while to notice that the front has just Dialga, Ash, and Pikachu (not a pair with Palkia) and so counts as an item for my Dialga collection. I don't know whether or not this can be used as (Japanese) postage, but it's from a long-running series of stamps. 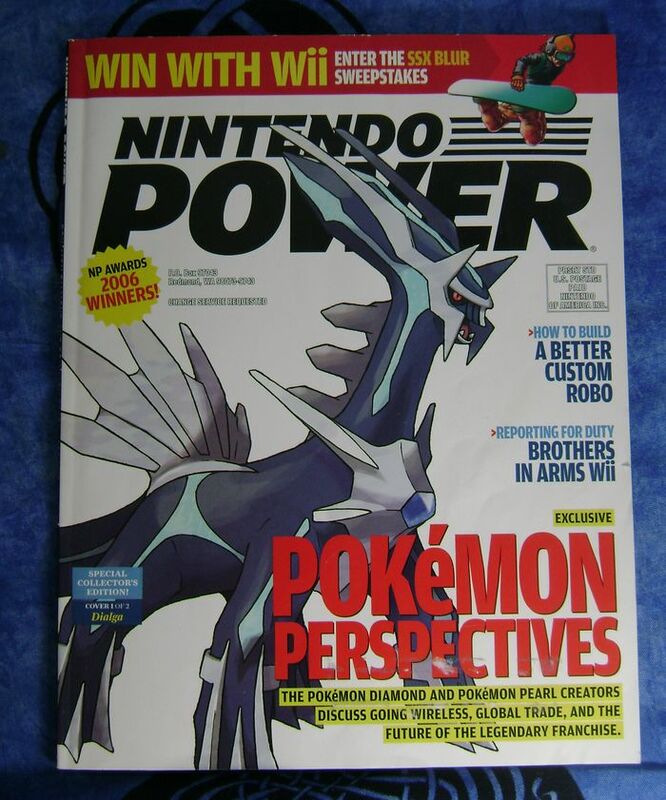 I thought I might have a bit of trouble finding this issue because it's a magazine from a few years ago, but it showed up on eBay! After I bought it, I saw quite a few more pop up (as if to say, hey, I'd like to get a few dollars for an old magazine too), but nope, I only needed one! 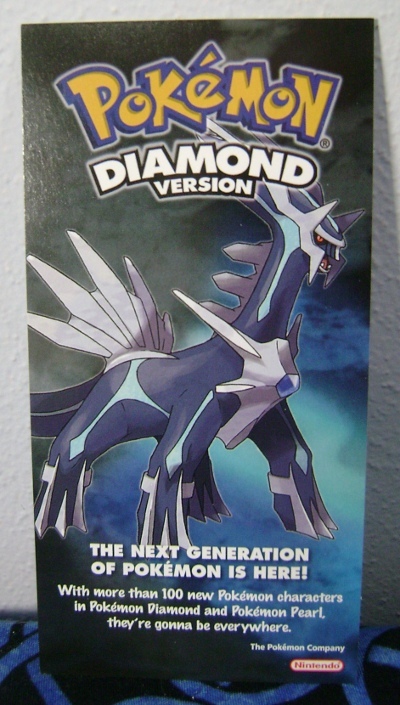 So, this is an issue of the Diamond & Pearl Adventures manga, which is not really centered on Dialga…but I'd seen this cover around and considered adding it to my collection, because the cover has Dialga front and center with no other Pokemon on it at all. I knew it was fairly common so I didn't want to import it myself, and eventually I found for a good price at the brick and mortar Kinokuniya in New York City. 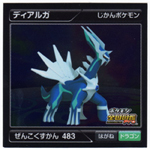 My search for Dialga items will never be done, because it seems there will always be more items like this one! I found this in a set with other DP Pokemon (Chimchar, Palkia, Torterra, etc), and after a quick purchase, here he is. 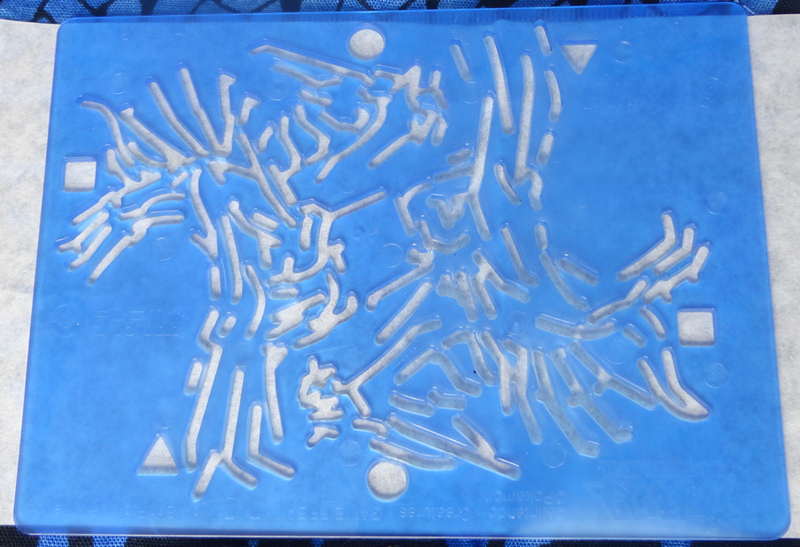 This is a fairly large decoration at about 5" on each side. 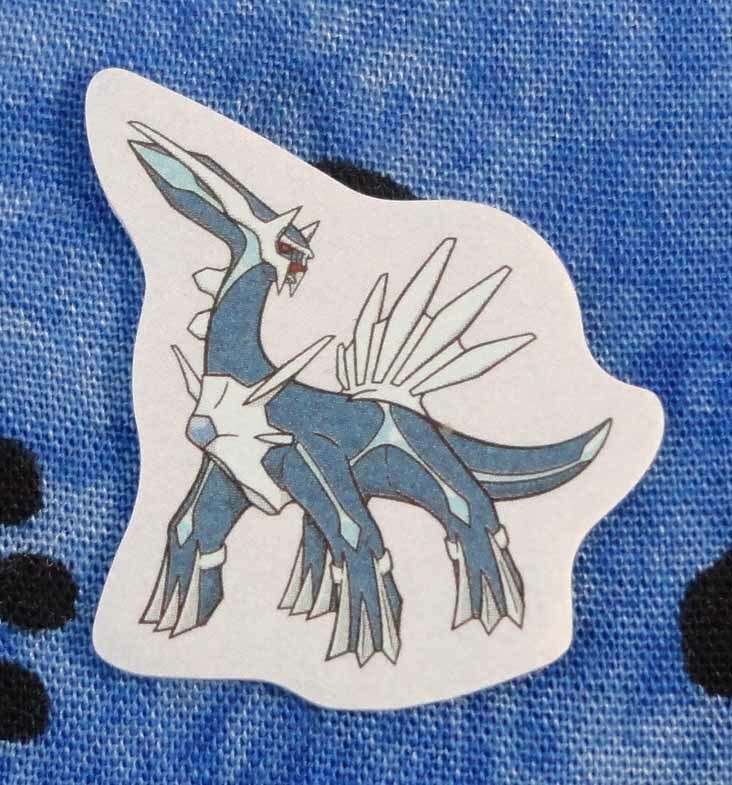 A tiny tattoo to show the Dialga love! I could wear this one, but I prefer to keep it unused and in my collection. 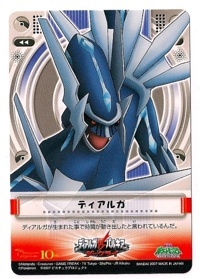 I don't know the set this card is from, but it appears to be from some kind of guessing game you play with a friend. 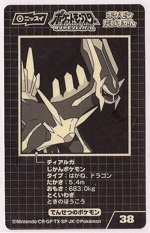 It has a list with 3 hints ("Type: Steel/Dragon", "Description: Time Pokemon" and a partial picture of the Pokemon). 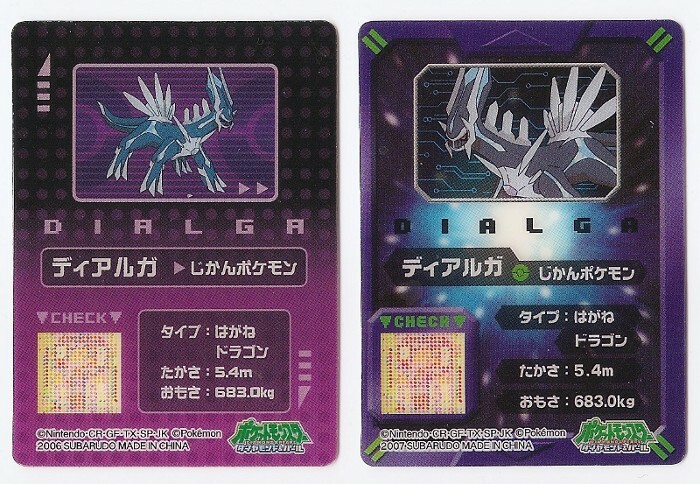 Maybe you read these to a friend and try to get them to guess Dialga! 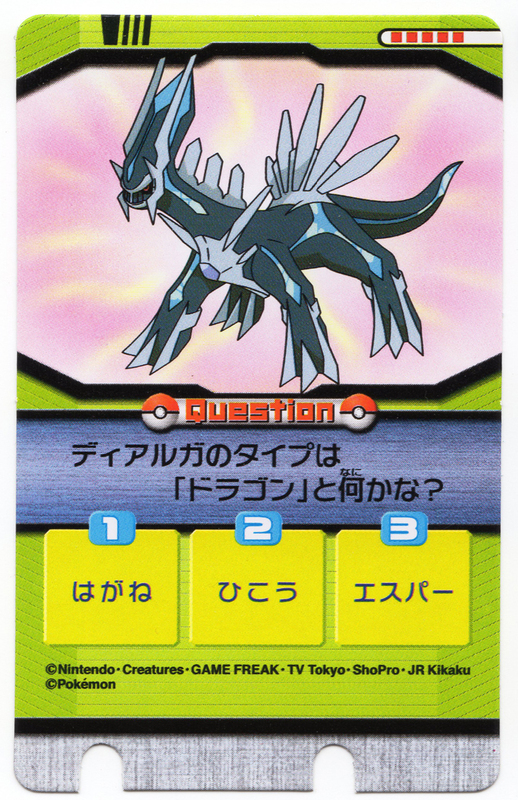 This trivia card (asking about Dialga's second type) is from a little set of trivia cards. 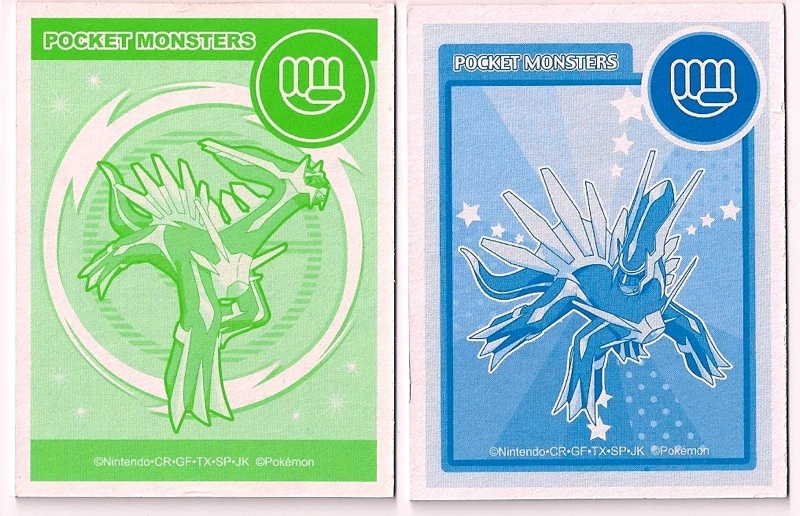 I'm not sure of the name of the set since the box just said "Pocket Monsters", but it looked to be from DP era. Source: A gift from my boyfriend! Near the end of 2008, my boyfriend bought me a page-a-day Pokemon calendar that features a different Pokemon each day (often in a unique pose). I don't usually use those as I don't know where to put the old pages (I can't just throw them out!) so it was left unused for a while. 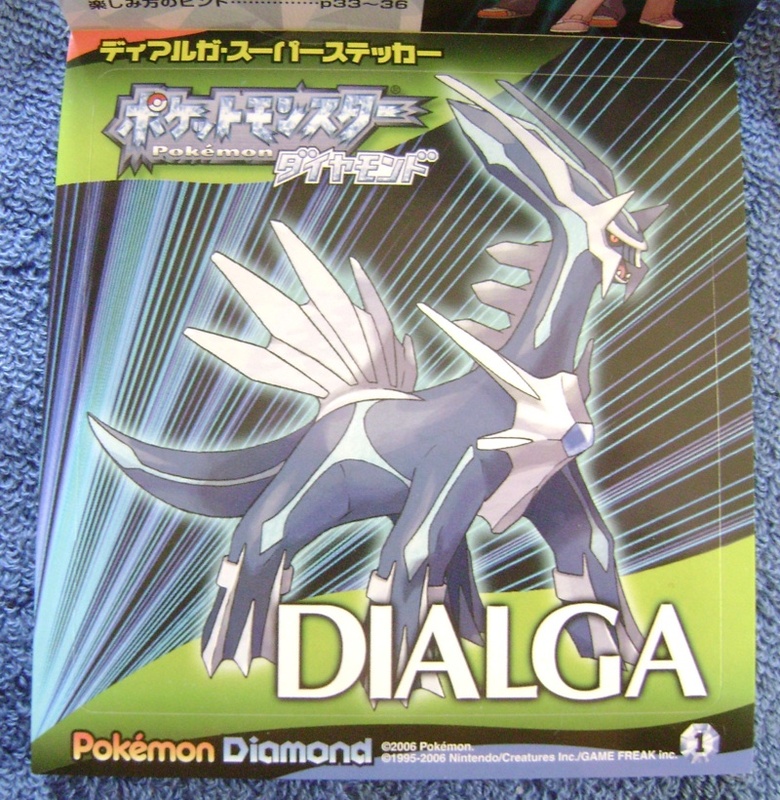 Recently though, I was looking through the pages near the end of the year to see if there were any Pokemon my friends liked that I could send in their packages, and here was this nifty Dialga page! 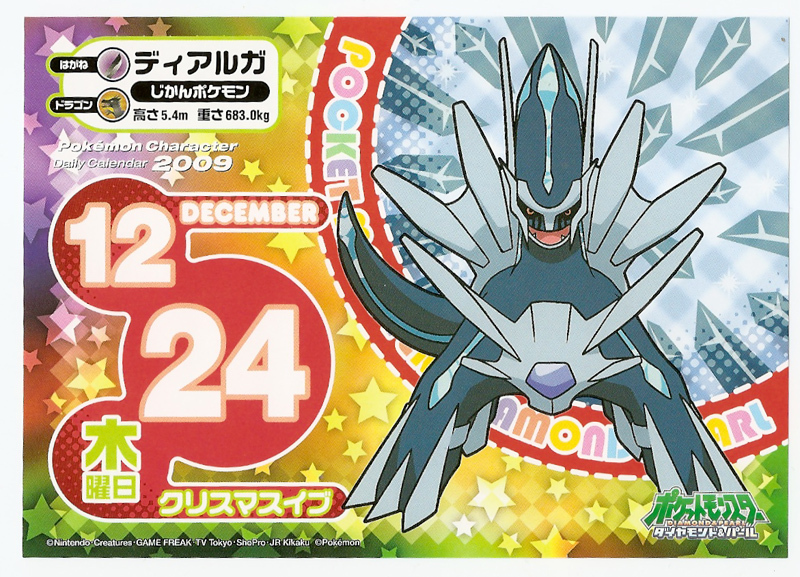 I'm not sure what Dialga has to do with Christmas Eve, though. Perhaps he's like a reindeer? Since they're intended to be thrown out once the day is over, it turns out that these calendar pages can be really hard to find! I was delighted when my friend Crunch offered me this one in trade. 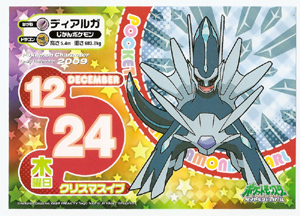 The 2010 page is on my wanted list, the 2011 calendar was bi-weekly and I don't think included Dialga, and I don't know whether or not such a calendar was made for 2006 or 2007. I'd be glad to buy or trade for any pages I'm missing! Since these 2012 and 2013 pages are of the same type, I've grouped them together here. This page is similar to the above two, except that it covers a full month (February) instead of just a day. The 2012 page teaches the meaning of a set phrase: "Time waits for no man, so make good use of the time you have. 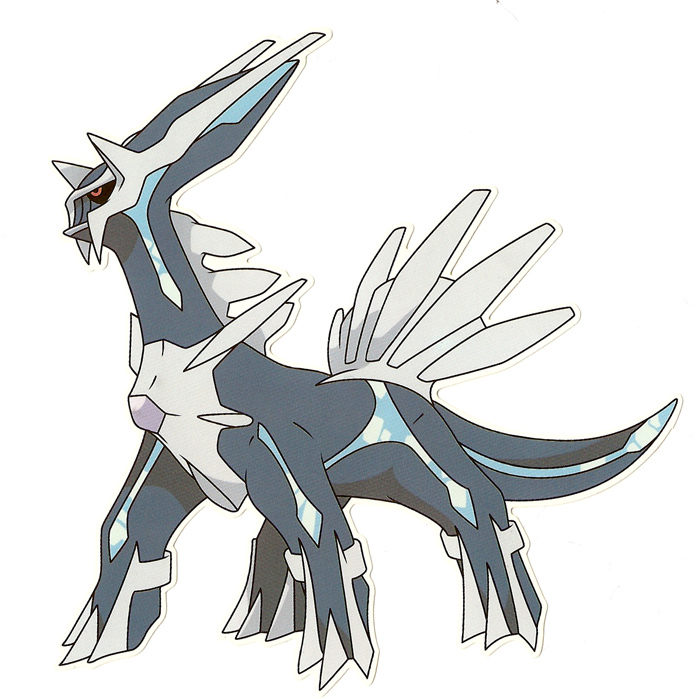 It's foolish to think that Dialga may stop time for you." The 2013 page teaches the meaning of a four-character compound, 空前絶後, meaning "something unprecedented that seems unlikely to ever happen again", and gives an example sentence of "Dialga and Palkia's battle was an isolated incident". 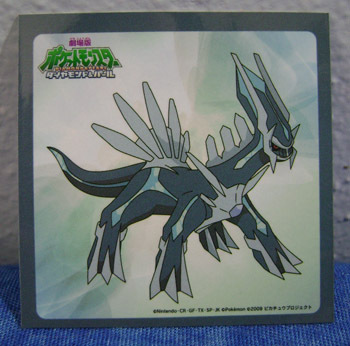 When you collect a Pokemon like Dialga who is not very popular (in pkmncollectors, anyway), there are often things that would be very cheap if you could just find them, but no one ever has them for sale. 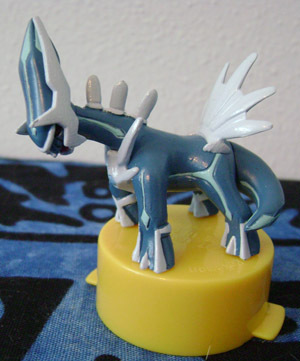 This one was on my wanted list for a long time, and finally he showed up for 1 yen on Yahoo! Japan. It cost a little more with fees and shipping, but I was still quite happy to get him! 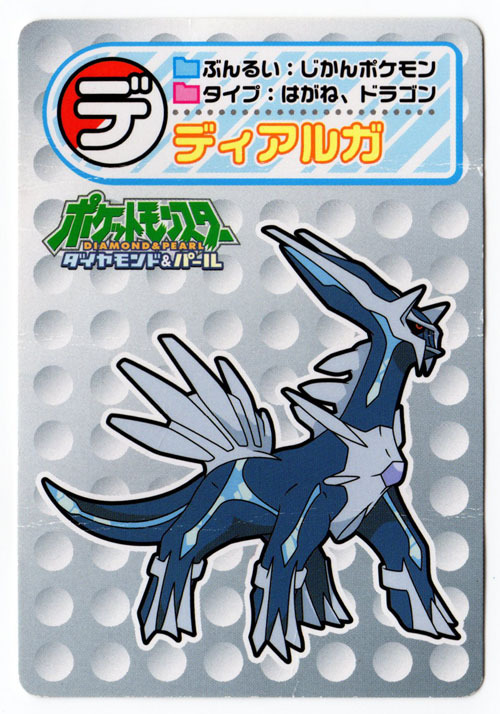 Here's another of Dialga's menko, this one from the first set. As far as I know, this is the only other one out there, but I'll keep a look out for more. 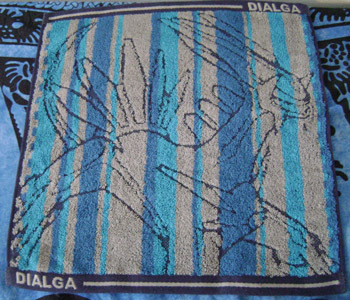 I missed out on this piece in a sales post years ago and it was in my wanted items folder for a long time. 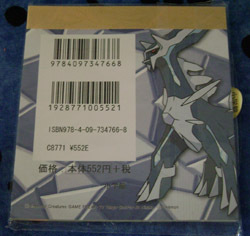 Then one day, it showed up in the mail as a surprise gift from pacificpikachu! Wow, thank you! 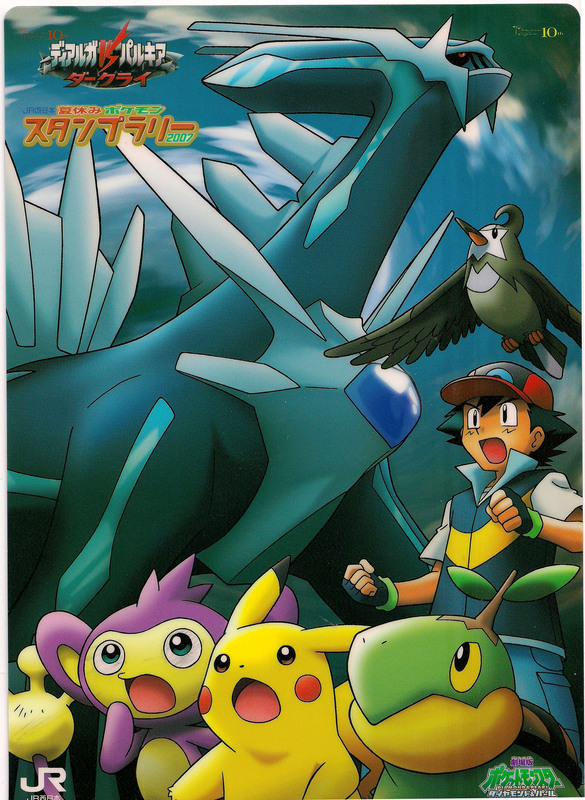 I found the name of this series from a Google search…while looking for something else entirely. 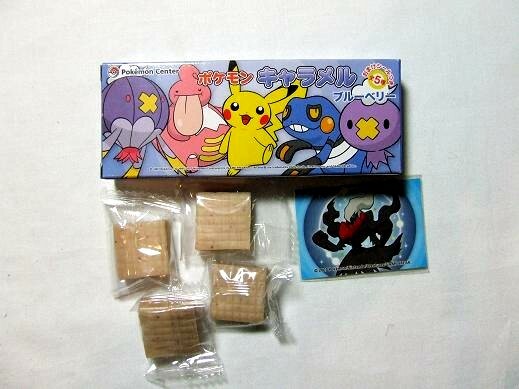 It's apparently a set of cardboard game pieces based around Pokemon in the 2008 (Giratina) movie. Another item that was a complete surprise! 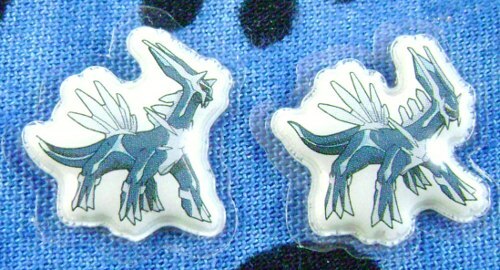 These came with some custom Jolteon charms I commissioned from moguryuu, which you can see on my Jolteon page. She told me that they're from a domino game that was included as a surprise in Pokémon themed Easter chocolate eggs in Italy. I wasn't really sure what these were when I found a box of them at Mitsuwa, but I took a chance on them and they're pretty neat! 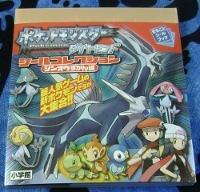 The box contains sheets of thin cardboard with cutouts of the Pokemon to pop out. 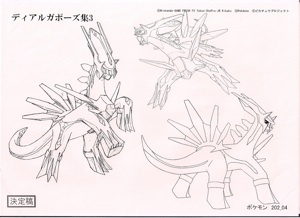 You then connect the pieces using small plastic joints (included in the box) and you can make the Pokemon move at the joints! I was also pretty surprised to see a different one of these for sale on Floaroma Pokemart, but for some reason that one is much smaller. 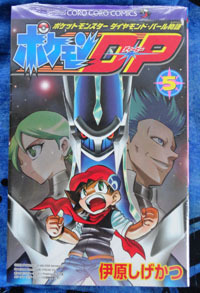 (It's also from a newer series. This appears to be a little screen cleaner. It's got soft foamy material on the top and a kind of sticky dust-grabbing surface on the bottom. 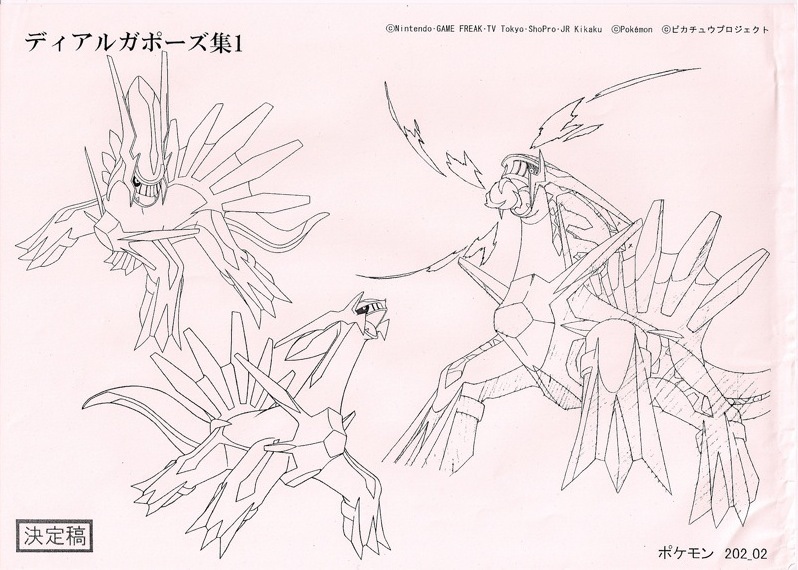 These are copies of the sketches used to produce the 10th and 11th Pokemon movies at the studio in Japan, which were distributed to the staff who worked on the movie. 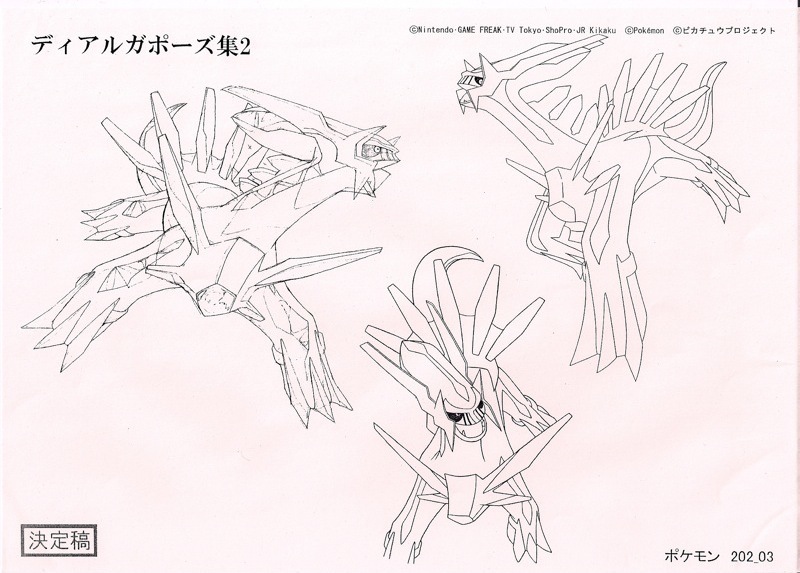 They're not quite as neat as genga, the original pencil sketches (which I'd love to get my hands on), but they're still pretty neat! 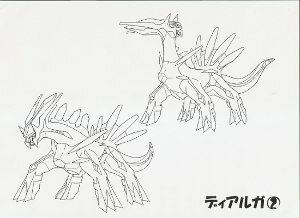 I am after any Dialga settei (or other production art) not shown here. The fourth one here also has another version where it has some parts colored (which I also have). You may be thinking "I see why the Dialga settei are here, but why Jesse and Meowth?" 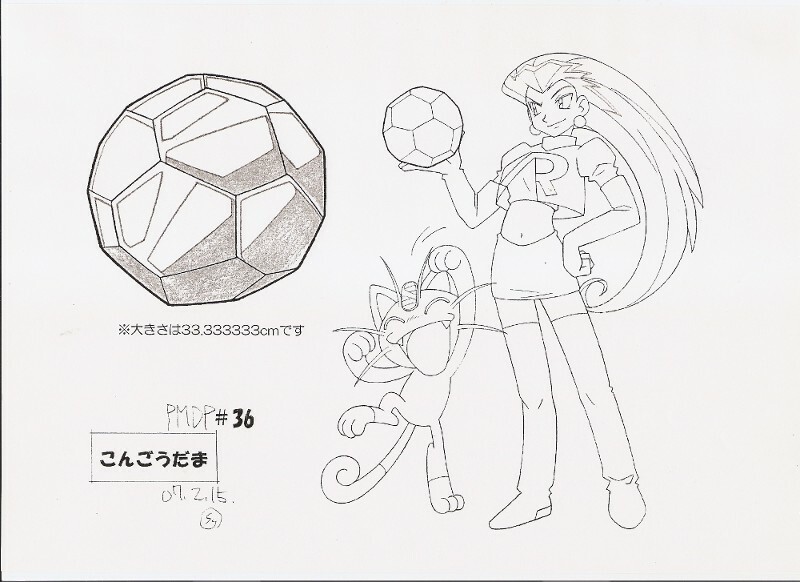 Well, that item she's holding is the Adamant Orb (こんごうだま), Dialga's signature item that boosts steel and dragon type attacks! This is probably the closest I'll get to official merchandise for that item, so I had to have it. 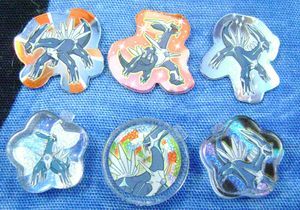 The Pokemon Centers have those machines where you put in 50 yen or so, and you can stamp a penny with a cool design by turning a crank. Unlike the American machines where you put in maybe a quarter and your own penny, you just put the Japanese currency in here - I guess it still stamps a penny, but most people in Japan aren't going to be carrying US currency! This pose of Kid figure has actually been released several times (as you can see in the linked photo), but this is the first time it's had a card sticker like this. Kids figures have included these stickers since their early releases in 1998 or so, but Dialga's didn't have any because they all came in special boxed sets, not individual boxes with just Dialga. 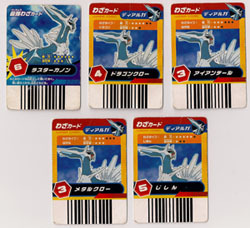 These tiny ring-shaped cards come with the spinning (Bashooon) figures on the Figures page. 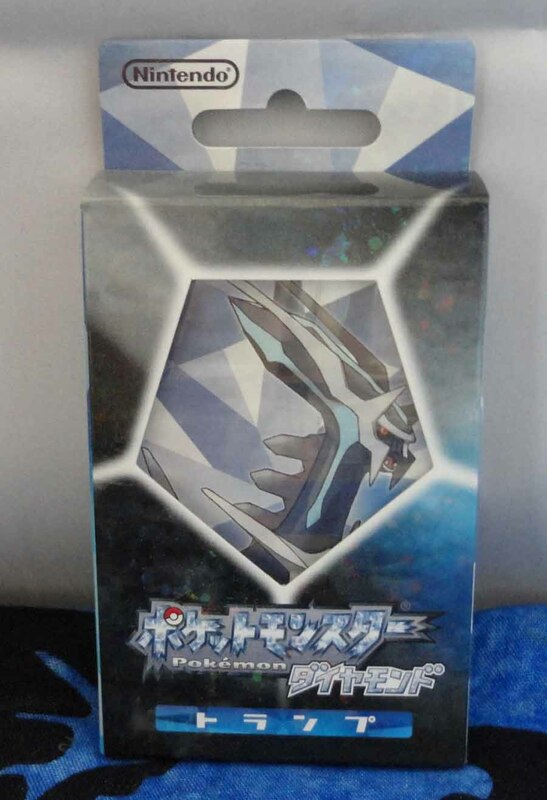 The red one comes with the individually sold regular Dialga figure, and the blue one comes with the metallic figure in a special boxed set (ポケモンDPバシューン！デラックスマスターボックス, or Bashooon Deluxe Master Box). 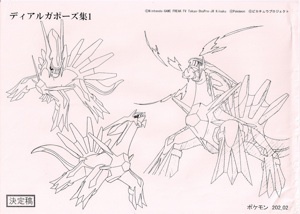 These came with the set of battle figures shown here. 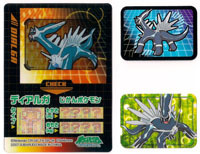 I believe you can scan them to use the attack name featured on the card? 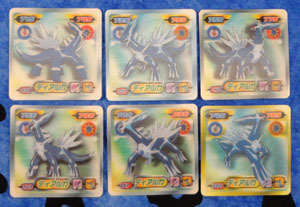 I was pointed to these on eBay (thanks vaporeon_07!) and so got them without the card. 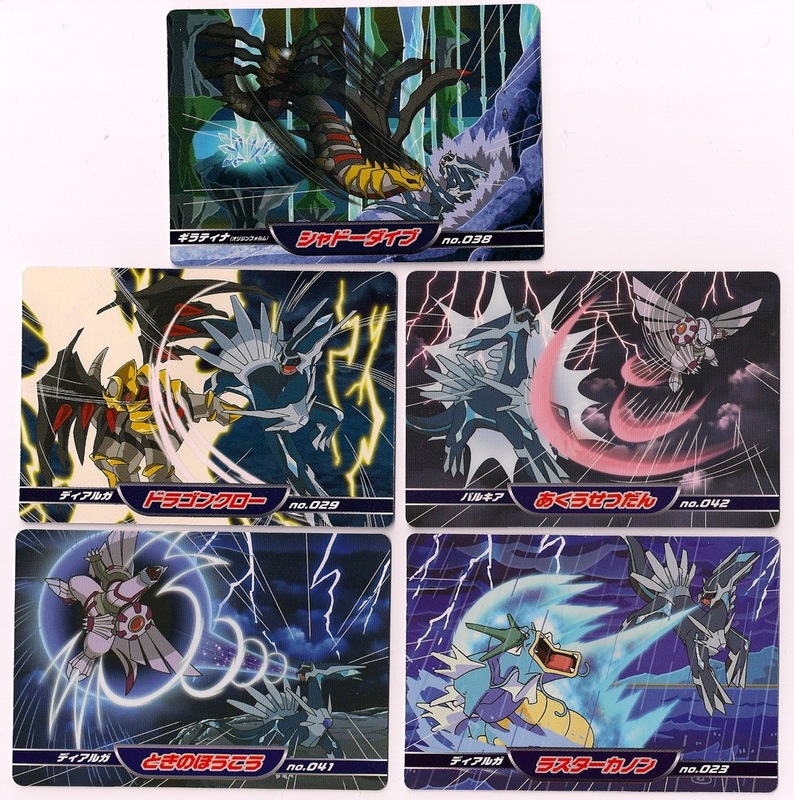 From what I can tell, there was a reissue of this set for Platinum that included some different Pokemon (namely Shaymin and Giratina). 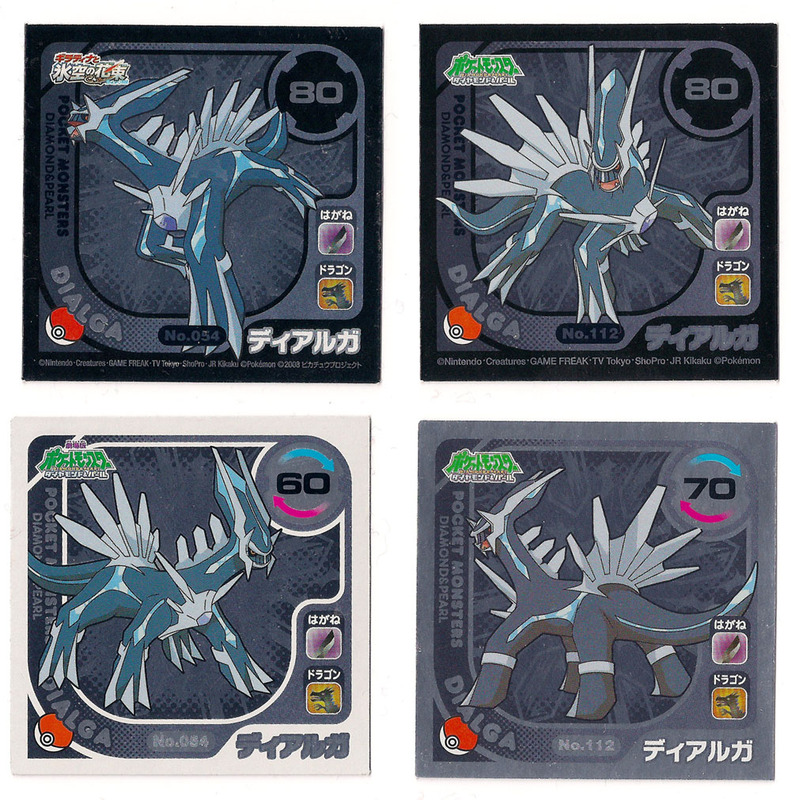 The figure is the same, but the cards look a bit different. 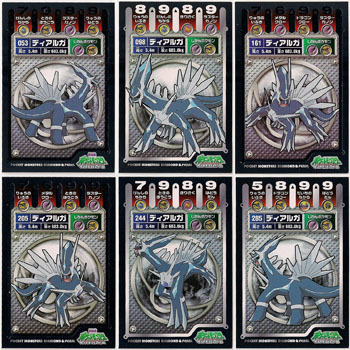 These are just like the above, except that they belong with the regular set instead of the Super one. I can't remember where I got these since I forgot to put them on the site right away, but they are pretty beat up!